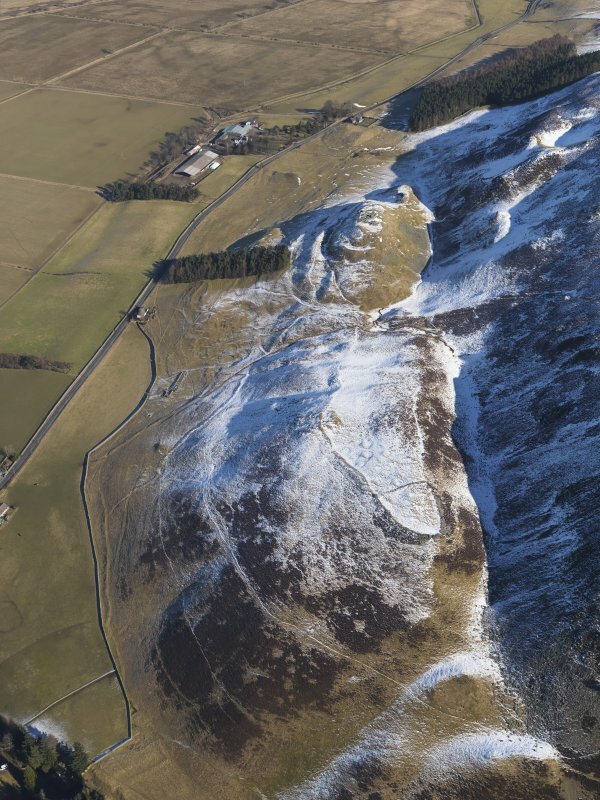 Oblique aerial view of the remains of the forts, cultivation terraces and the enclosure, taken from the NNW. 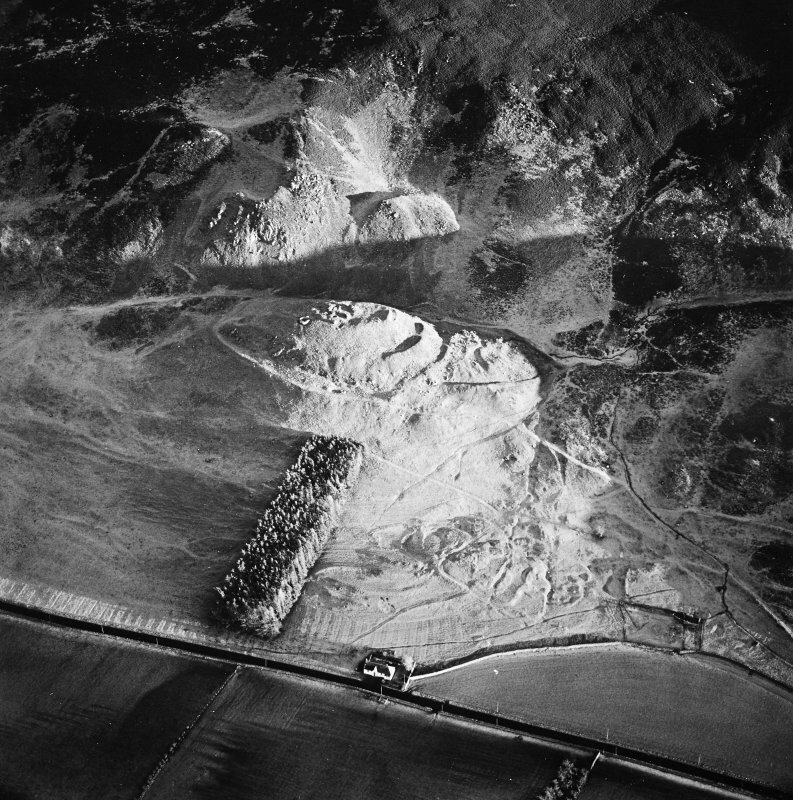 Oblique aerial view of the village and the remains of the forts, cultivation terraces and enclosure, taken from the ENE. 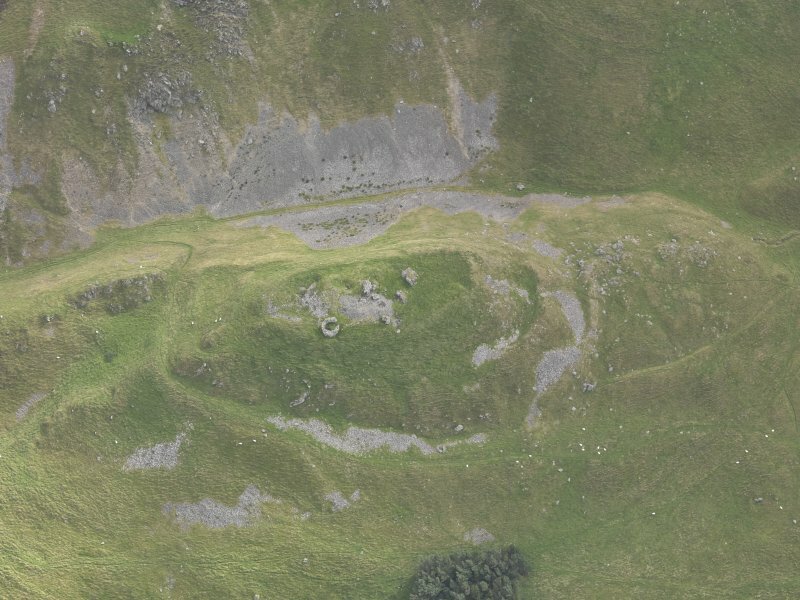 Oblique aerial view centred on the remains of the fort with the remains of the fort, castle and enclosure adjacent, taken from the WSW. 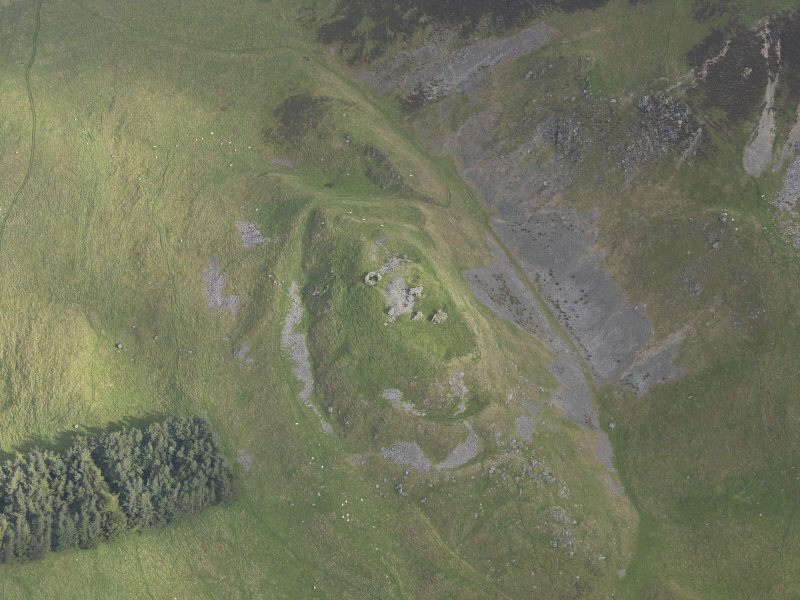 Oblique aerial view centred fort and castle from SE. 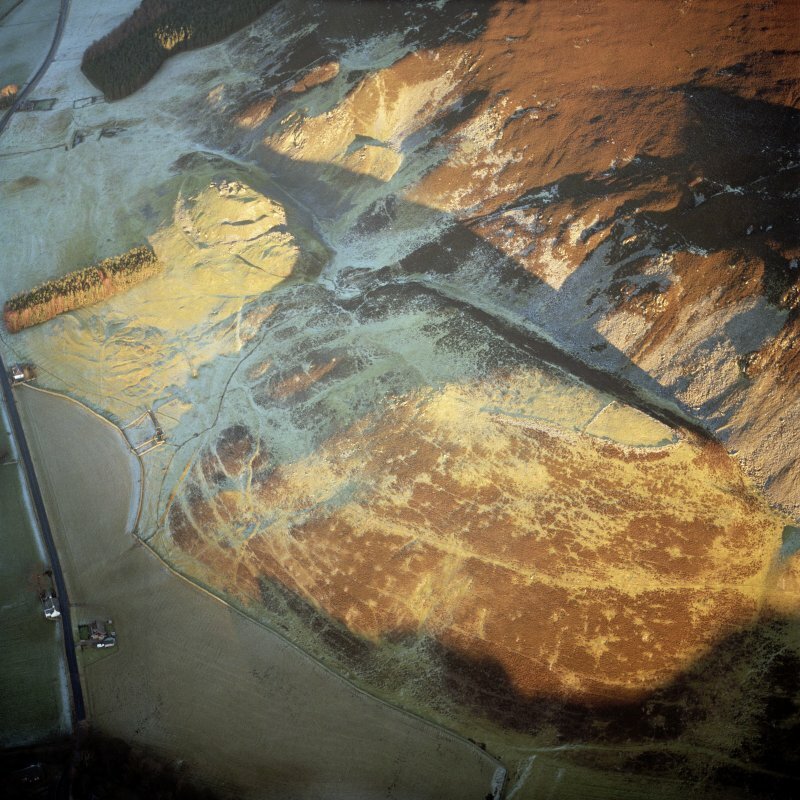 Scanned image of oblique aerial view centred on the remains of the fort and castle with the remains of the cultivation terraces and enclosure adjacent, taken from the E.
Scanned image of view of N angle tower. 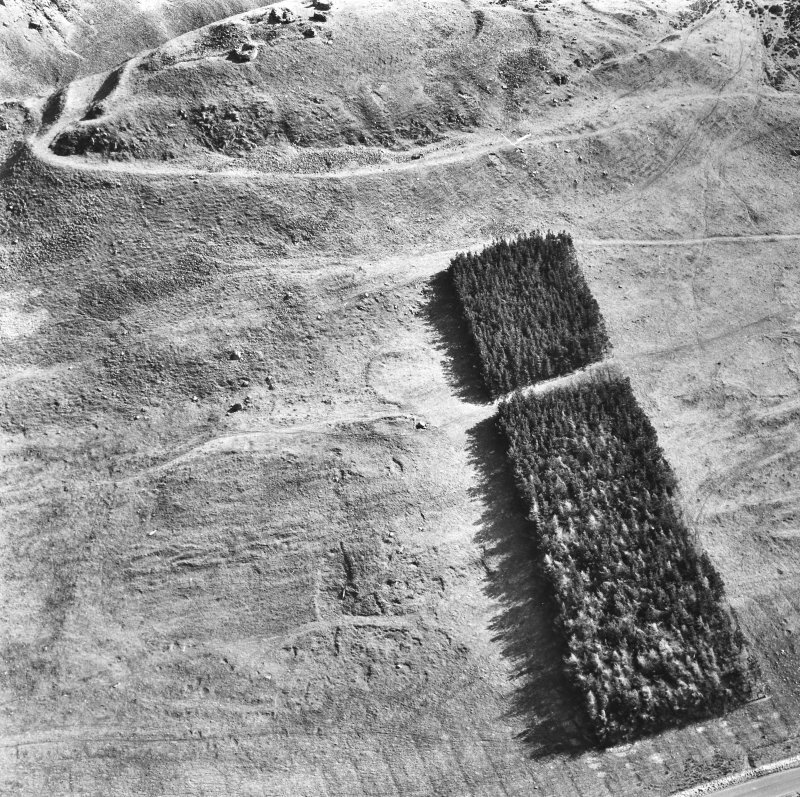 Oblique aerial view of the village and the remains of the forts, cultivation terraces and enclosure, taken from the NE. 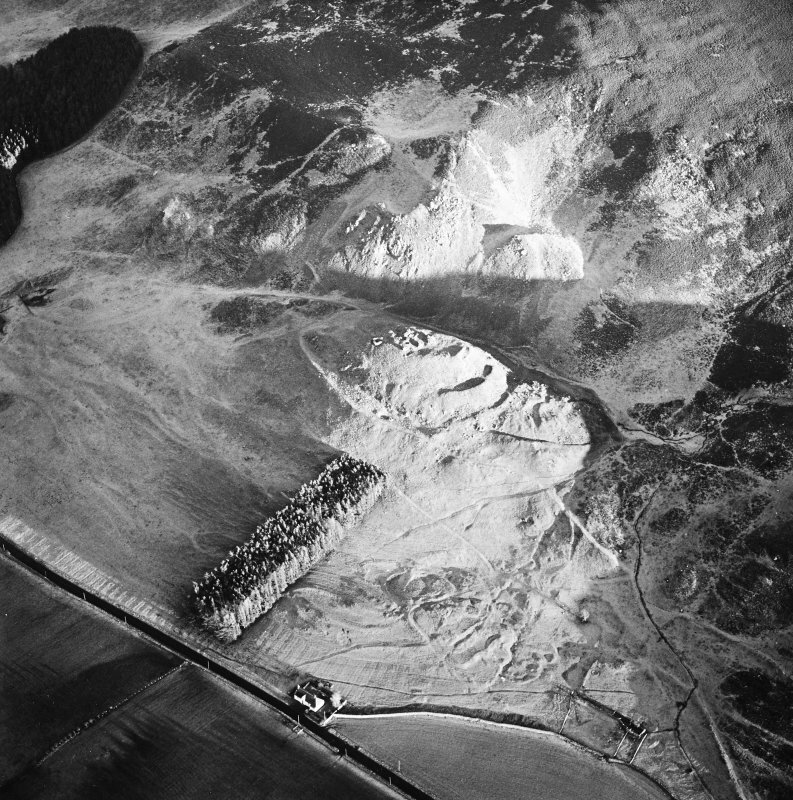 Oblique aerial view centred on the remains of the fort and castle with the remains of the cultivation terraces and enclosure adjacent, taken from the E.
Oblique aerial view centred on the remains of the fort and castle with the remains of the cultivation terraces and enclosure adjacent, taken from the SE. 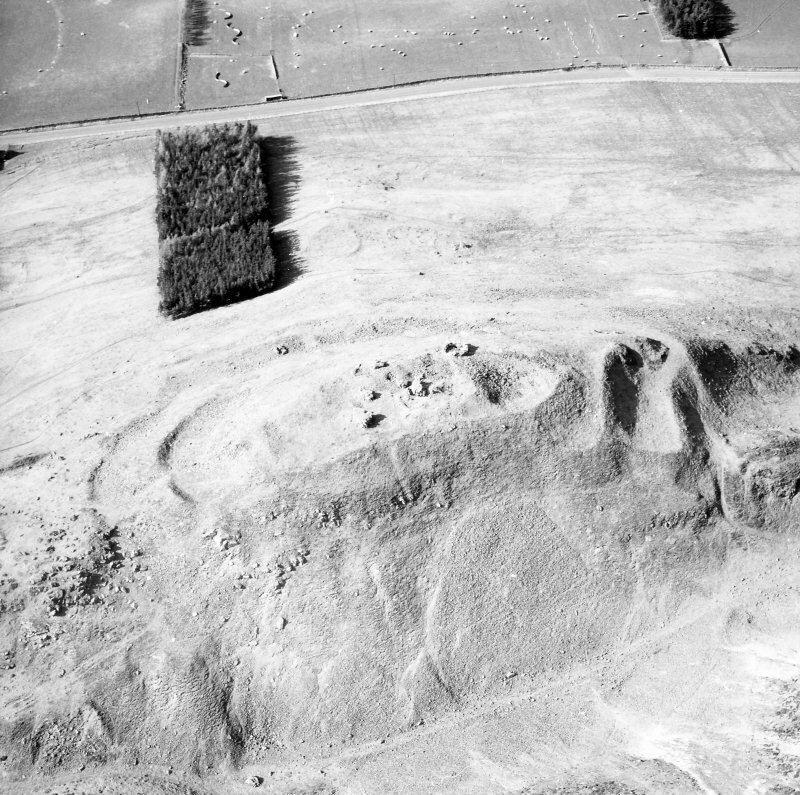 Oblique aerial view of Tinnis Castle, taken from the NW. Oblique aerial view of Tinnis Castle and fort, building, platform, settlement and track, enclosure and a burnt mound under snow, looking E.
General oblique aerial view of Henry's Brae fort, Tinnis Castle and fort, enclosure and building, platform, settlement and track, looking NE. 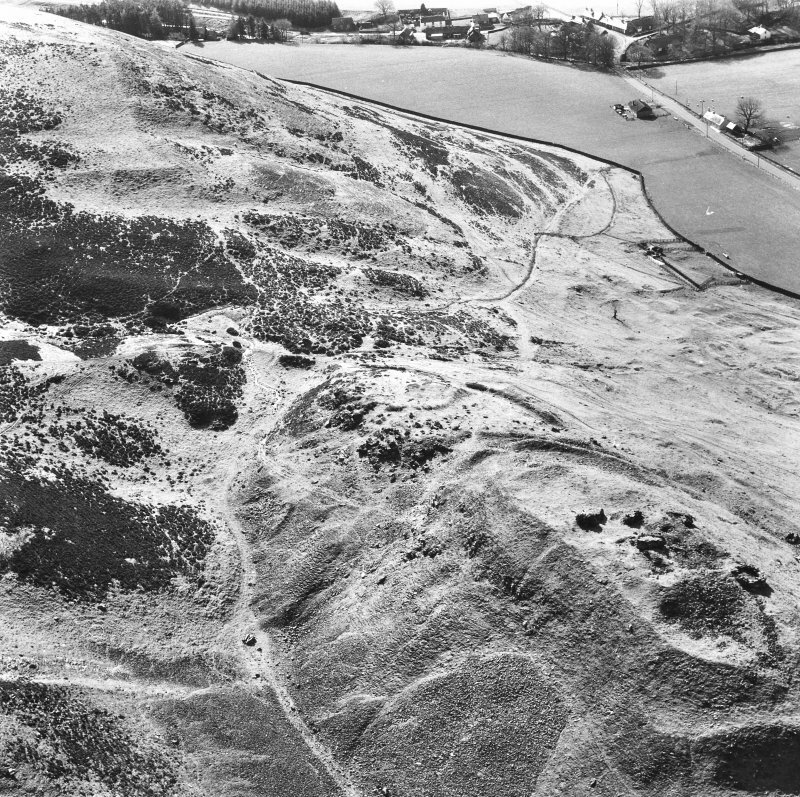 Oblique aerial view of the village and the remains of the fort, cultivation terraces and enclosure, taken from the NW. 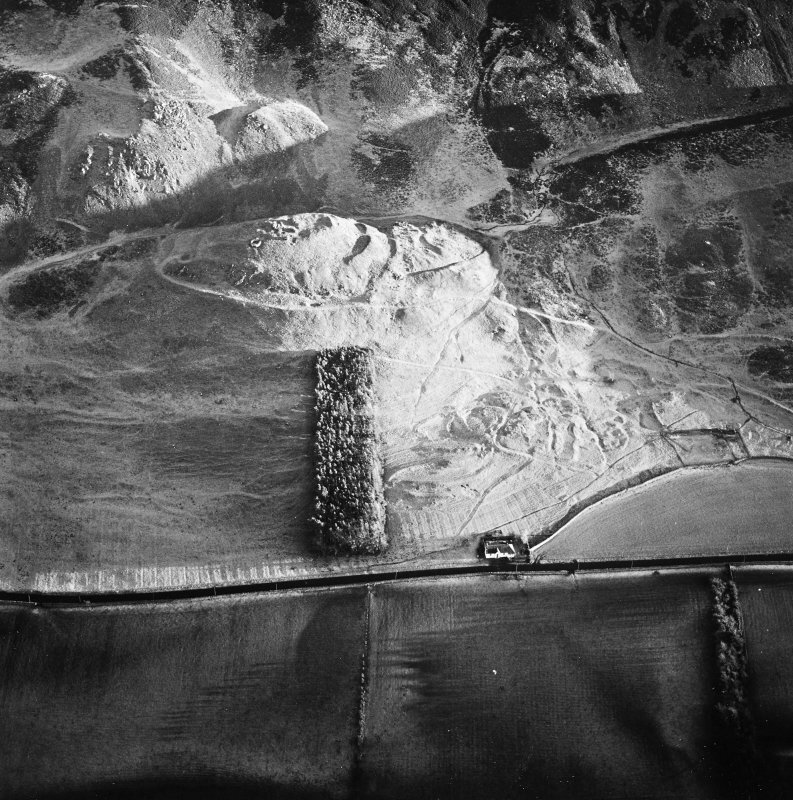 Oblique aerial view of the village and the remains of the fort, cultivation terraces and enclosure, taken from the E.
Oblique aerial view centred on the remains of the fort and castle with the remains of the cultivation terraces and enclosure adjacent, taken from the NW. 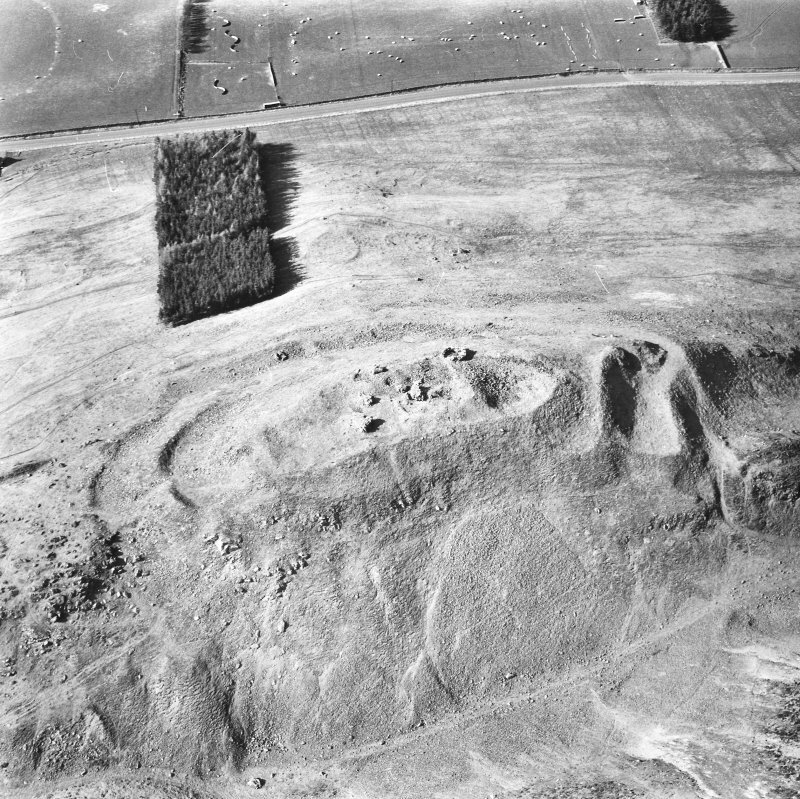 Oblique aerial view of Tinnis Castle, taken from the N.
Oblique aerial view of Tinnis Castle, taken from the SE. 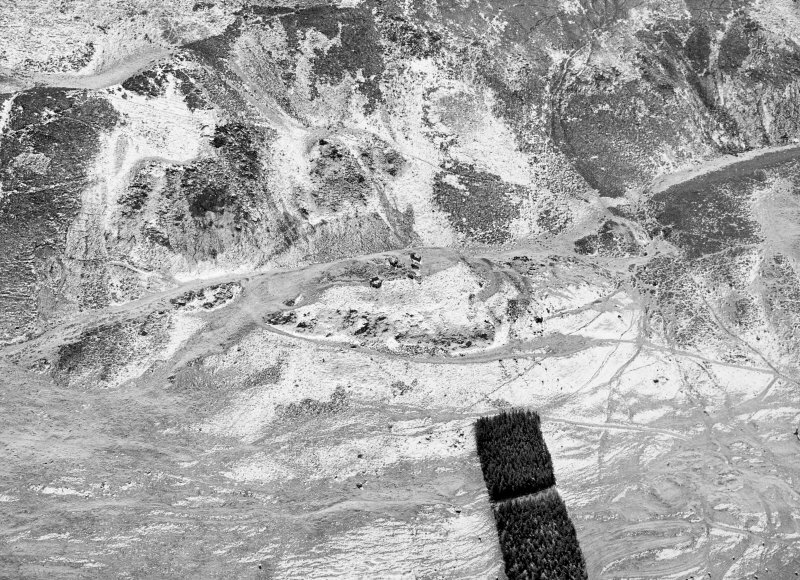 Oblique aerial view of Tinnis Castle and fort, building, platform, settlement and track, enclosure and cultivation terraces under snow, looking E.
Oblique aerial view of the remains of the forts, cultivation terraces and the enclosure, taken from the NW. 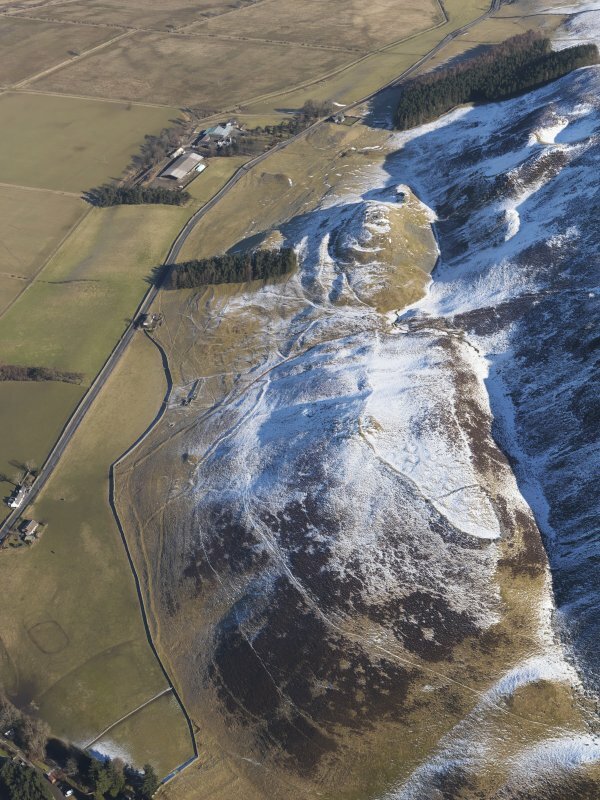 Oblique aerial view centred on the remains of the fort and castle with the remains of the cultivation terraces and enclosure adjacent, taken from the WNW. 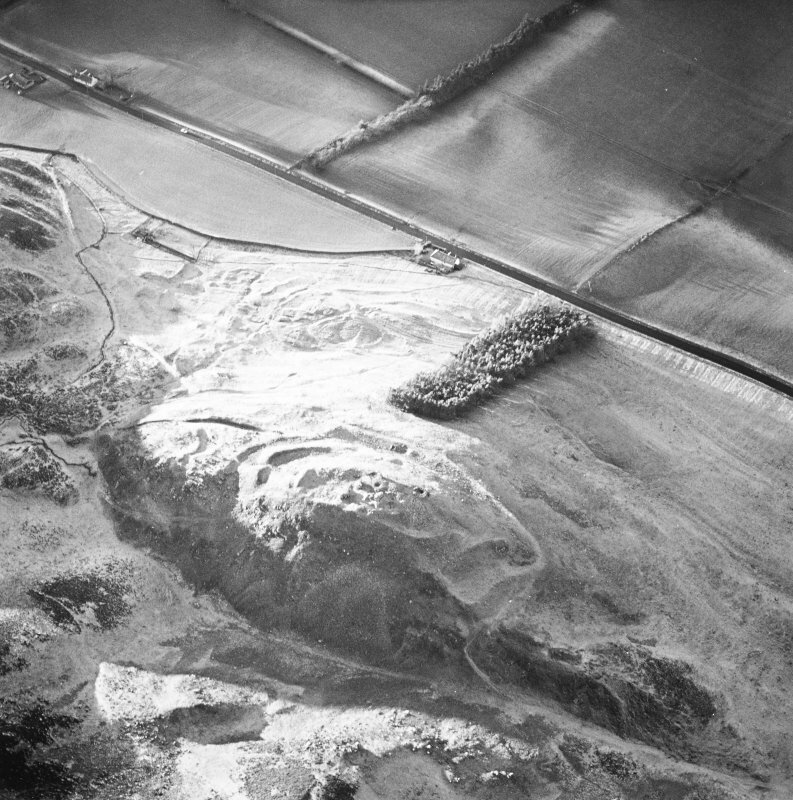 Oblique aerial view centred on the remains of the fort and castle with the remains of the cultivation terraces and enclosure adjacent, taken from the W.
Oblique aerial view centred on the remains of the fort and castle with the remains of the cultivation terraces and enclosure adjacent, taken from the NNE. 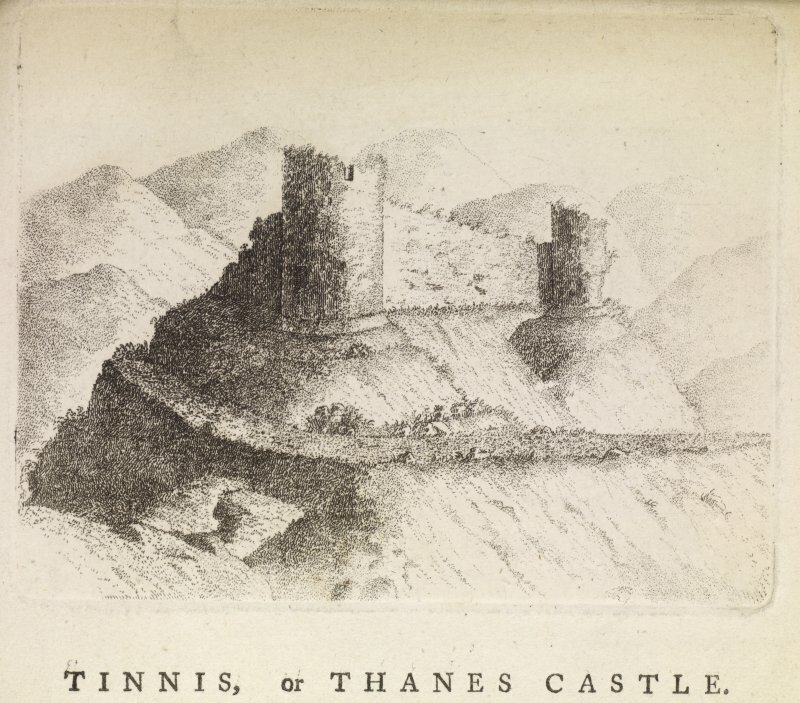 Oblique aerial view of Tinnis Castle, taken from the ENE. 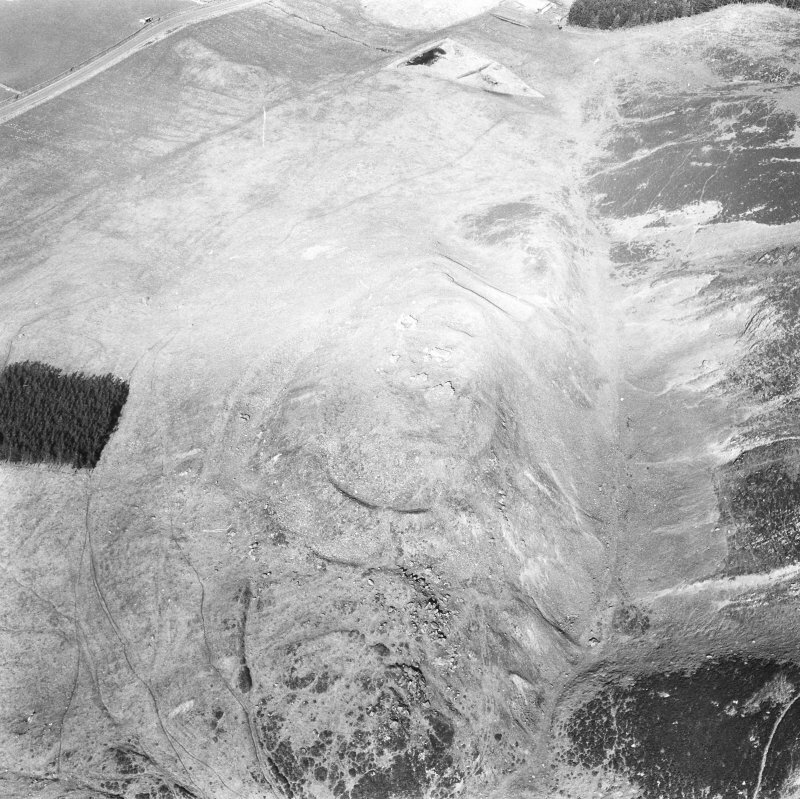 Oblique aerial view of Tinnis Castle, taken from the SW.
Oblique aerial view of the remains of the forts, cultivation terraces and the enclosure, taken from the W.
General oblique aerial view of Henry's Brae fort, Tinnis Castle and fort, enclosure and building, platform, settlement and track, looking NNE. 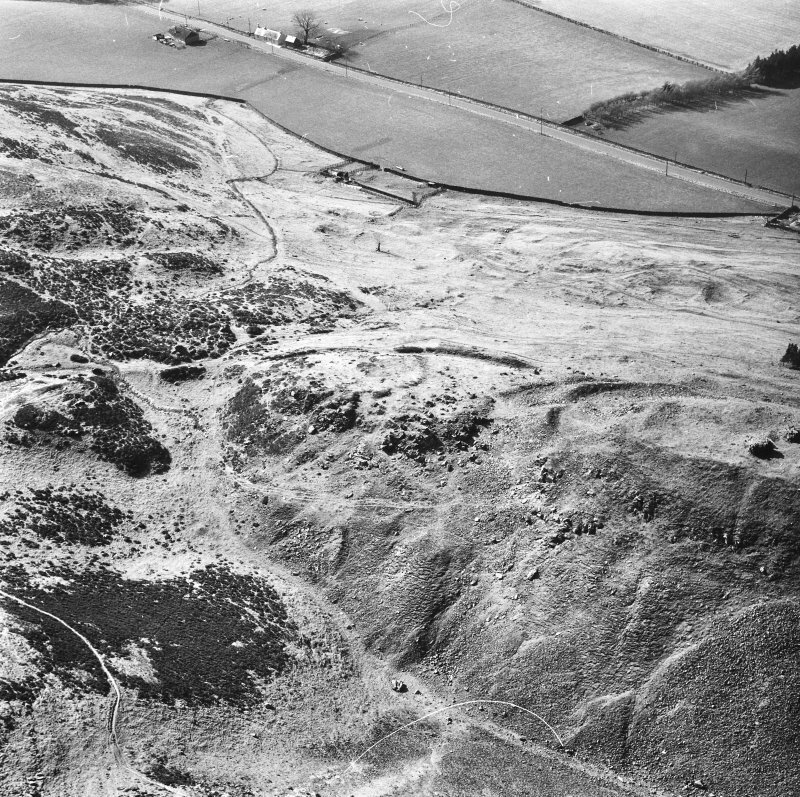 Scanned image of view from S.
Oblique aerial view of Tinnis Castle, taken from the SSW. 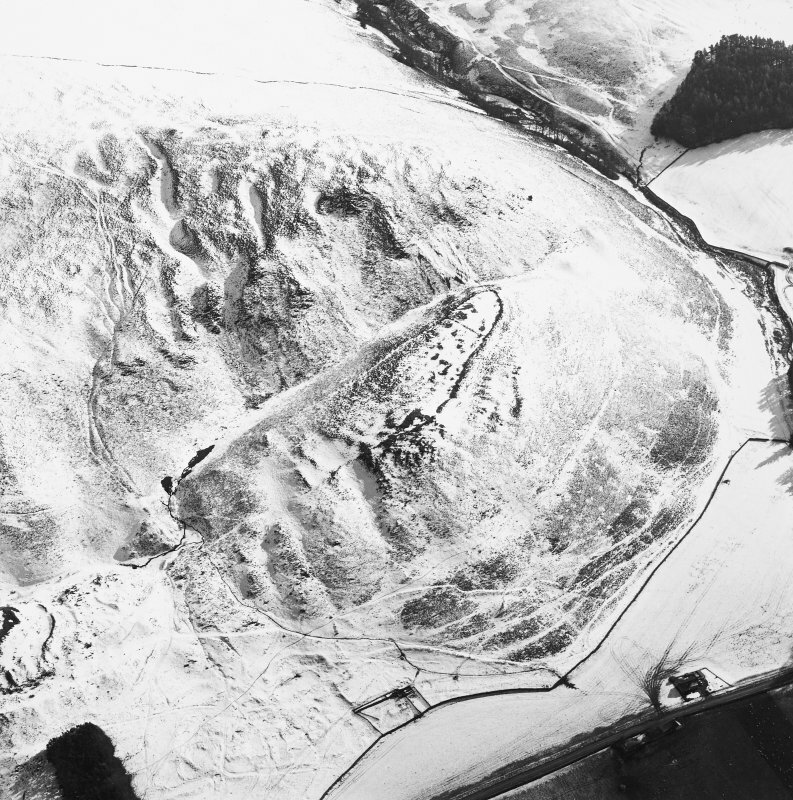 Oblique aerial view of Tinnis Castle and fort, building, platform, settlement and track, burnt mound, enclosure and cultivation terraces under snow, looking SSW. 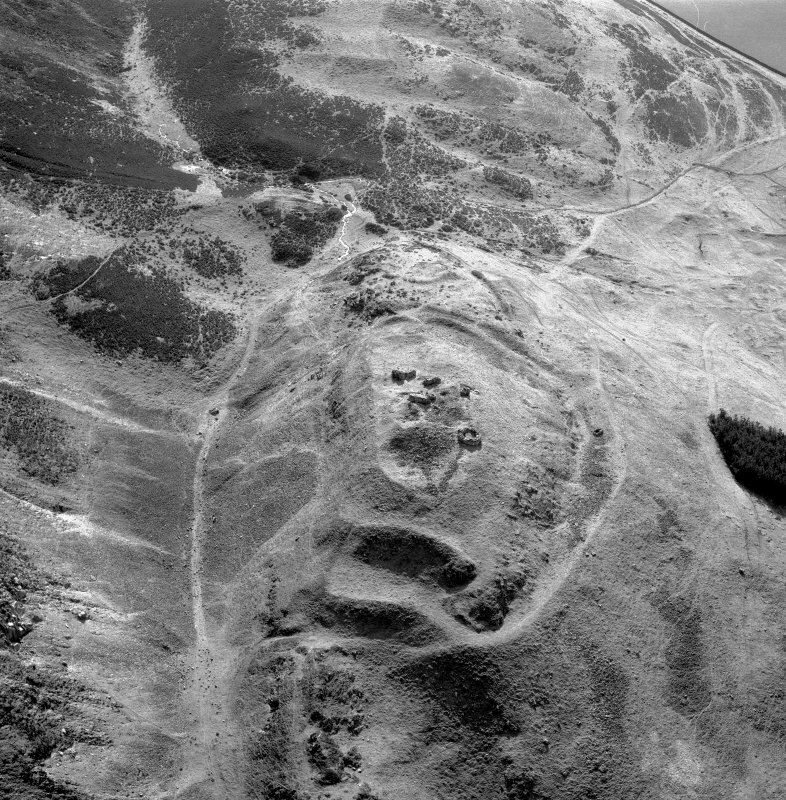 Scanned image of oblique aerial view centred on the remains of the fort with the remains of the fort, castle and enclosure adjacent, taken from the WSW. 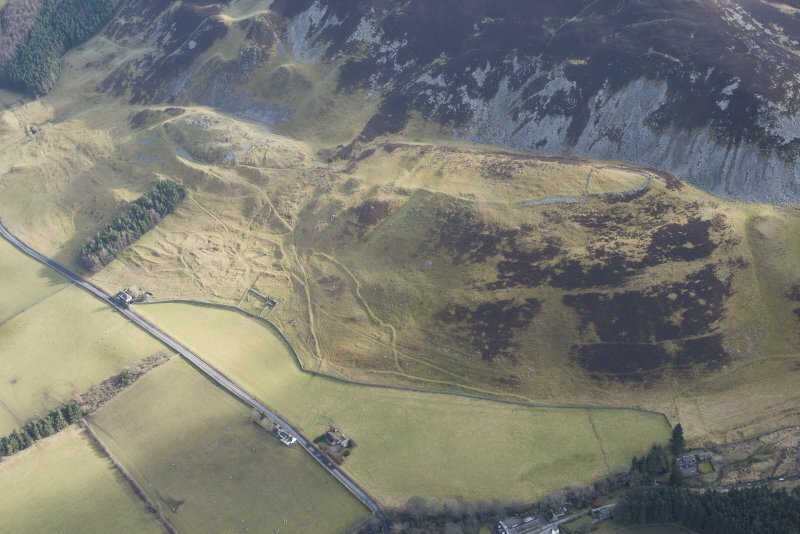 Oblique aerial view centred on the remains of the fort with the remains of the fort, castle and enclosure adjacent, taken from the W.
Oblique aerial view of Tinnis Castle, taken from the S.
Tinnis Castle and Fort: The remains of this castle occupy a prominent position on the summit of a rocky knoll which overlooks the valley of the Tweed less than half a mile NE of Drumelzier. 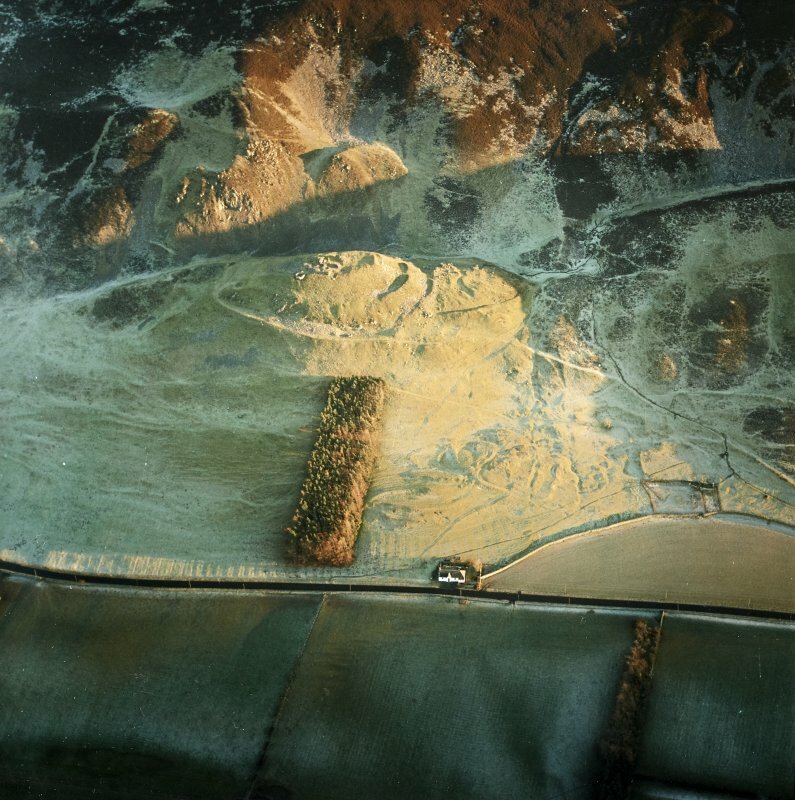 The medieval castle was erected within an Iron Age fort of which considerable traces still survive. 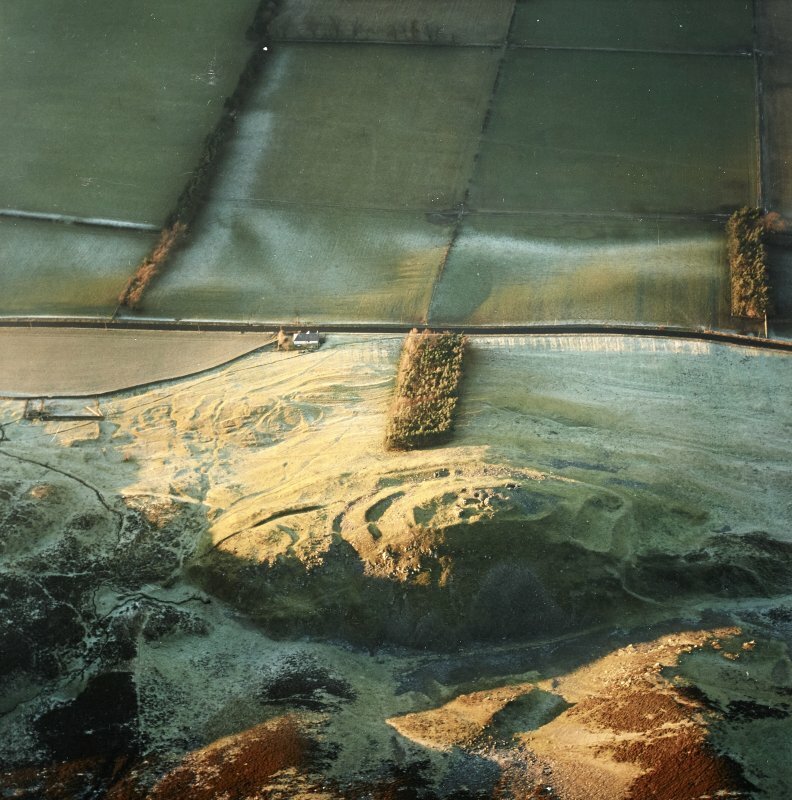 Because of the fragmentary nature of the existing remains, the original extent may best be appreciated by a study of the plan (see RCAHMS 1967 plan, fig.134). 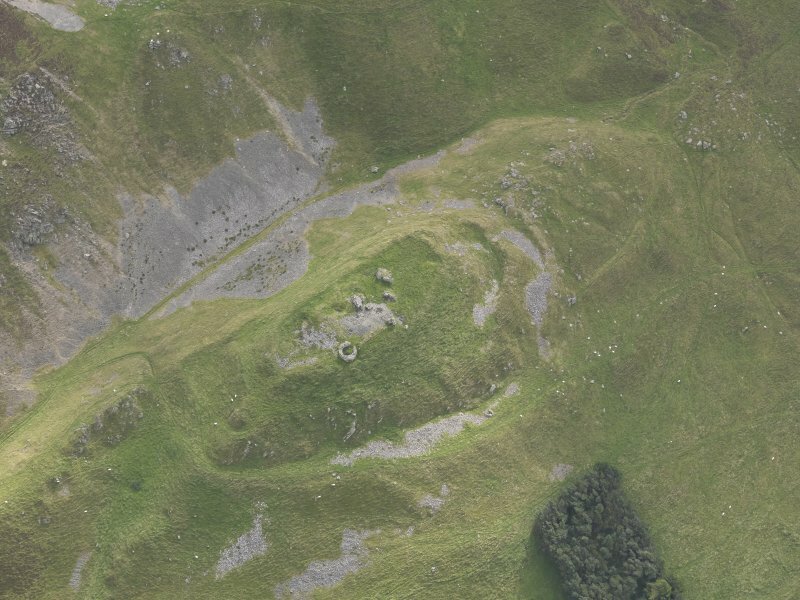 This indicates that the castle was quadrangular in form, measuring externally 88'6" from SW to NE by 74'6" transversely. 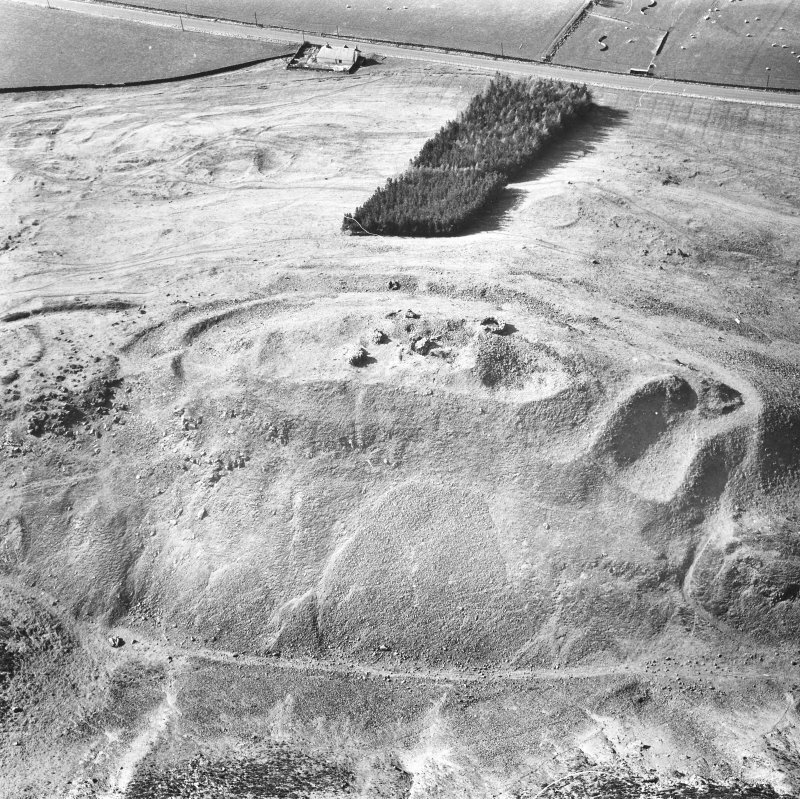 The main residential buildings appear to have stood on the SE side of the enceinte, the remaining area being occupied by a courtyard enclosed on three sides by substantial curtain-walls. 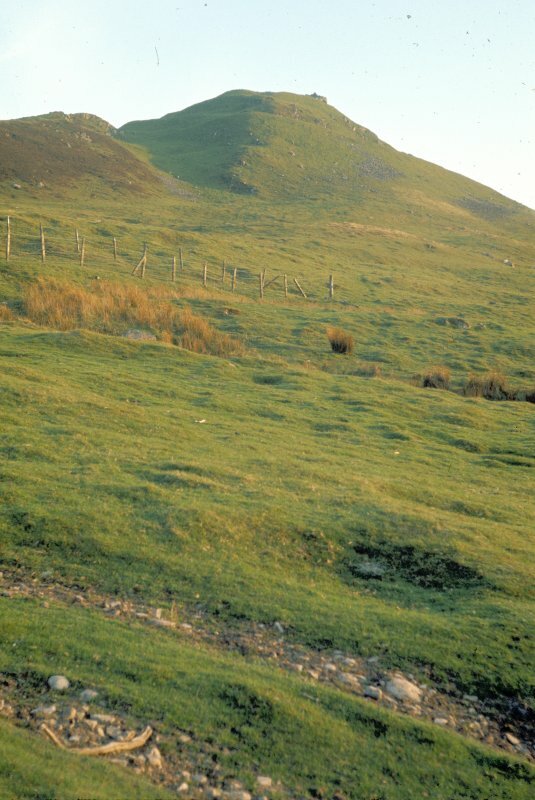 An old road, which probably formed the principal access to the castle, ascends the NW side of the knoll, and returns to approach the summit from the NE. 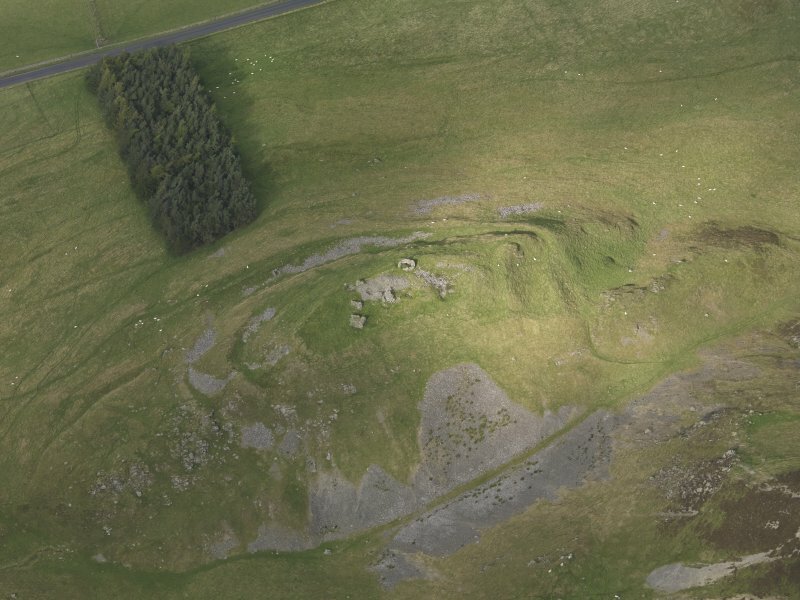 From this point the road may have led directly to an entrance in the NE curtain-wall, or, more probably, it may have followed the platform that skirts the SE angle of the castle, returning at the S angle to serve an entrance in the SW curtain. 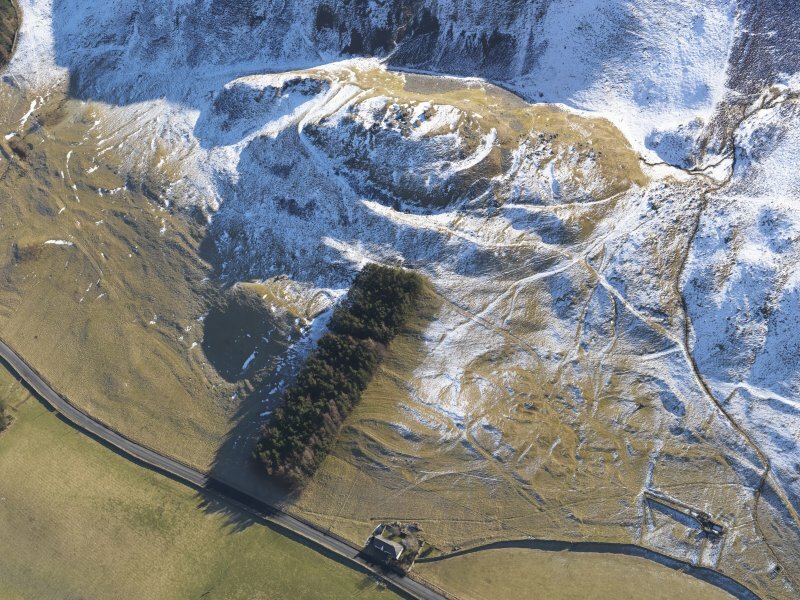 All the masonry appears to have been constructed in local whinstone rubble excellently bonded with lime mortar; no freestone dressings are now visible. 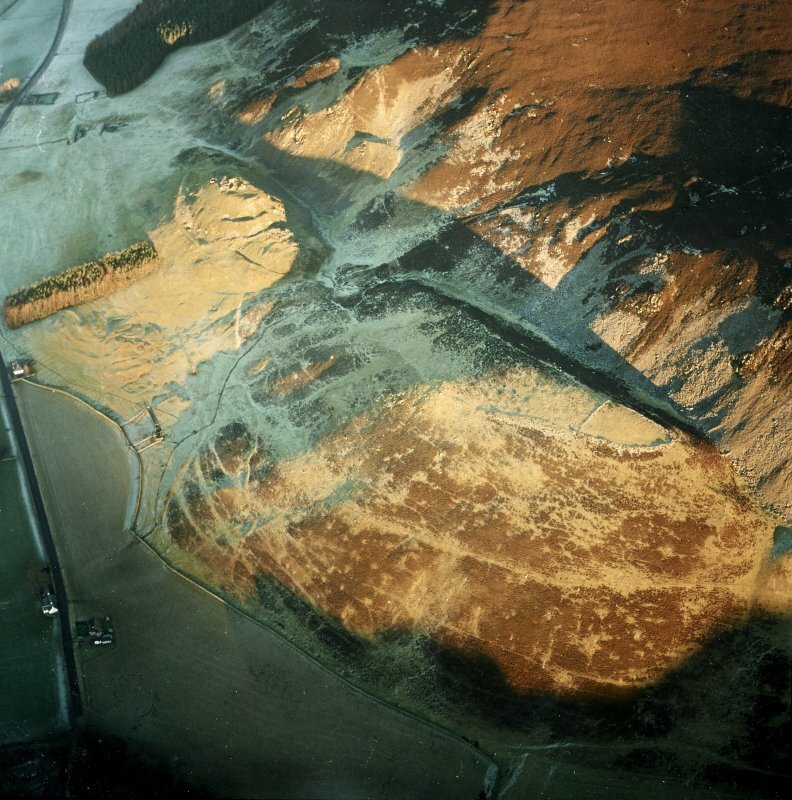 There is some evidence to suggest that the residential buildings incorporated a tower-house at the S angle of the enceinte, and the large masses of mortar-bound masonry that now lie scattered upon the site may probably be identified as fragments of a structure of this type. Some of the fragments show evidence of barrel-vaulting; they apparently formed part of a building of which the external walls measured about 4'6" in thickness. Almost nothing now survives of the curtain-walls that bounded the SW and NE sides of the courtyard, but portions of the NW curtain remain to a maximum height of about 2'6", the wall having a thickness of 3'3". 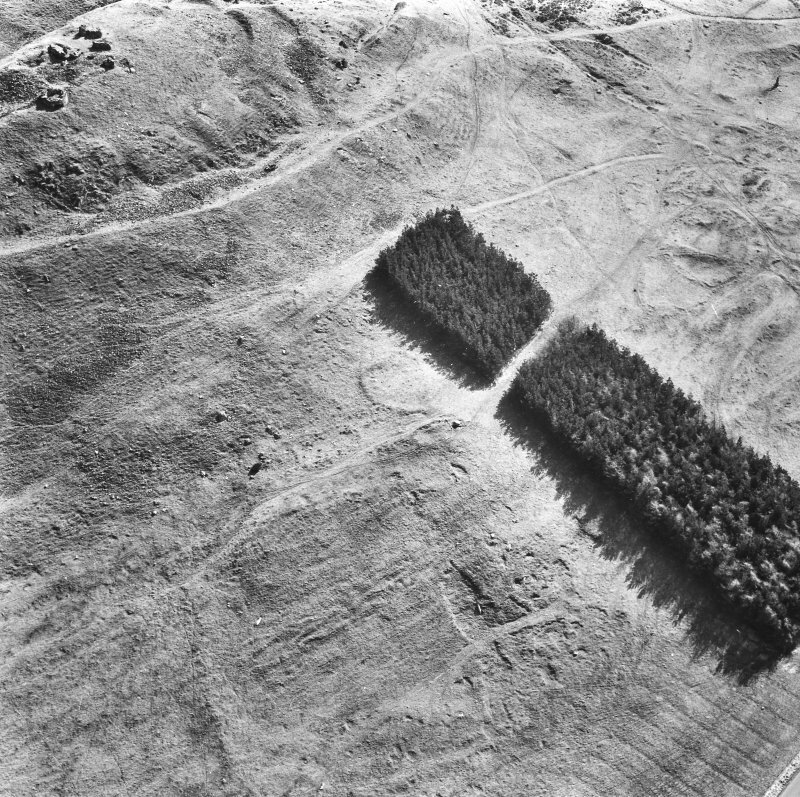 At the N and W angles of the enceinte there were circular towers, having an external diameter of 18'9" over walls about 3'6" thick, but MacGibbon and Ross appear to be in error in asserting that similar towers existed at the S and E angles of the enceinte. The N tower is now the better preserved, its walls rising to a maximum height of 8' above the exterior ground surface. 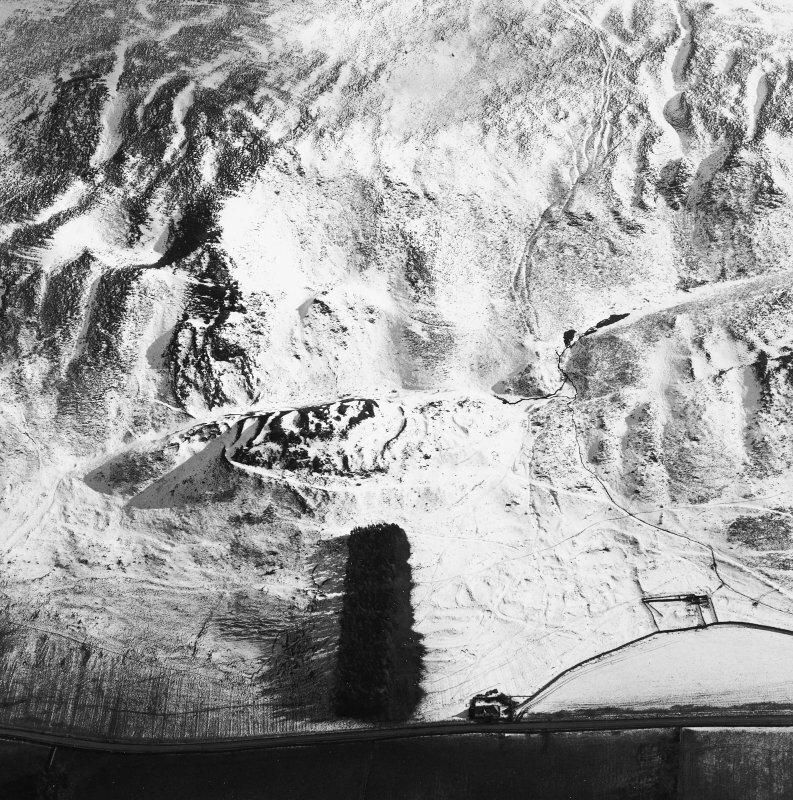 Very little now remains of the W tower and no architectural features are discernible. 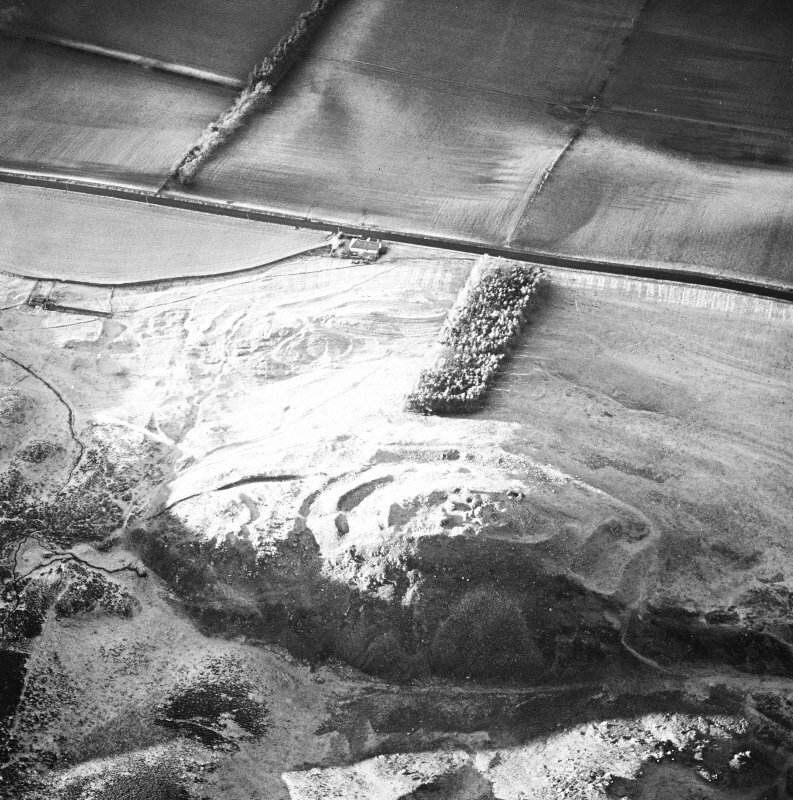 On the strength of the architectural evidence now available the castle may be ascribed to the 15th or early 16th century, and it was probably erected by a member of the family of Tweedie of Drumelzier to whom the property belonged from the early 14th to the early 17th century. 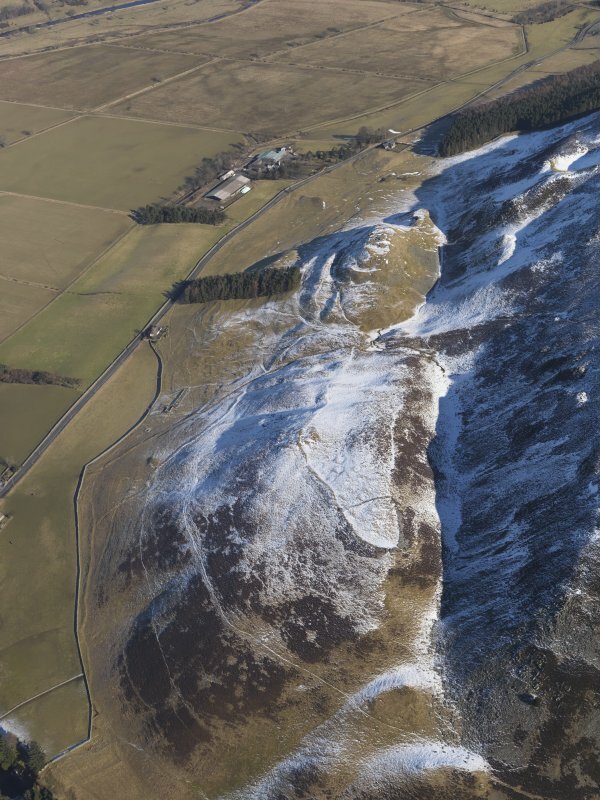 An anonymous account of Tweeddale, compiled in the late 17th century, records that "The House (of Tinnis) was blown up with powder by the Lord Fleeming whose Father Drumelzar had slain in a bloudy Feud that continued betwixt the Families." 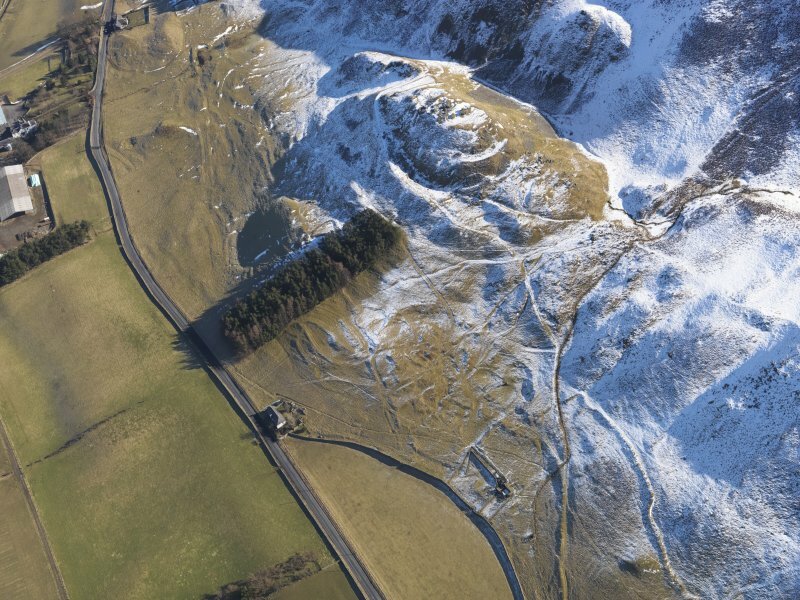 Notwithstanding the possibility of some confusion having arisen in this account between the castle now under discussion and the house of "Tynneis", Selkirkshire, for the demolition of which a royal warrant was issued in 1592, the author may in fact preserve a soundly based tradition. 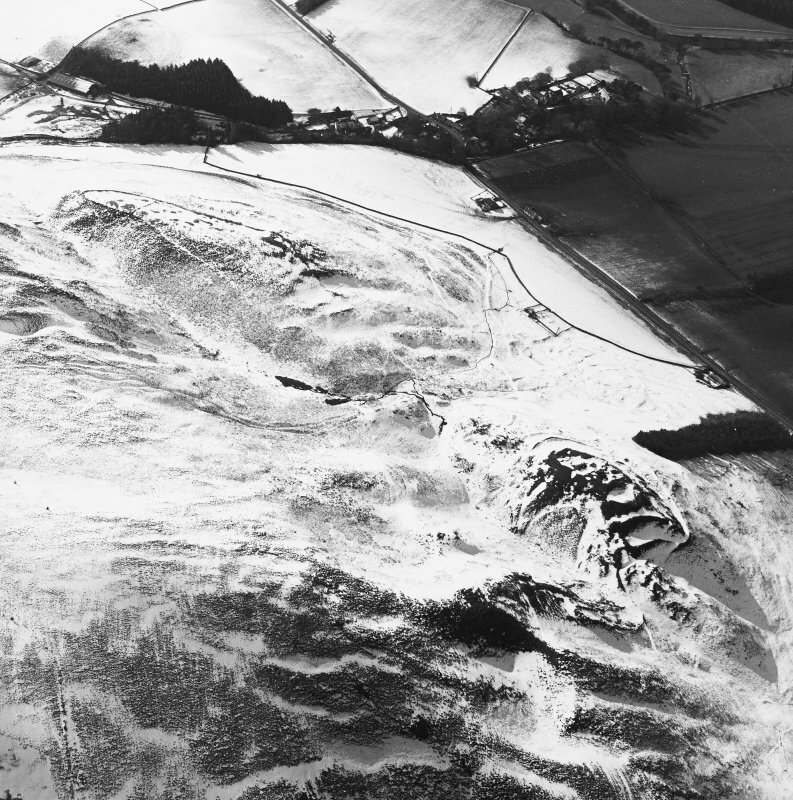 Certainly the large size of the fragments of mortar-bound masonry above described, coupled with the fact that some of them have evidently been displaced a considerable distance from their original positions, suggests that the building was demolished with explosives. 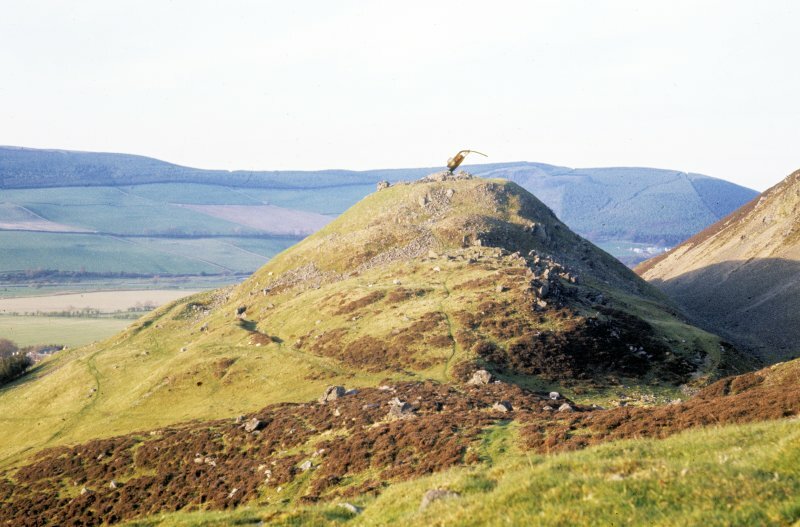 Moreover the feud between the Tweedies and the house of Fleming is well authenticated, the murder of John, 2nd Lord Fleming, having taken place in 1524. The fort measures 230' by 85' within a wall (A) which encloses the natural summit-plateau of the ridge. 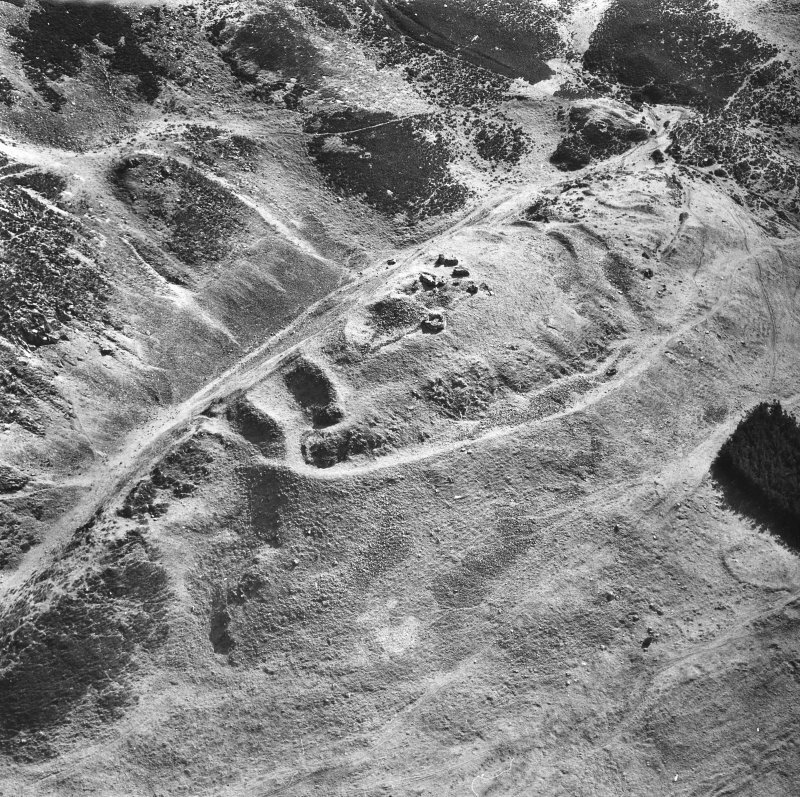 The SE flank of the ridge is so steep that no further fortifications were necessary on that side, but on the more moderate slopes at either end there are the remains of two outer walls, B and C. Wall C, which is accompanied by an internal ditch on the SW side, continues round the NW flank, but wall B, situated higher up the slope, was either not completed or has been eroded away. 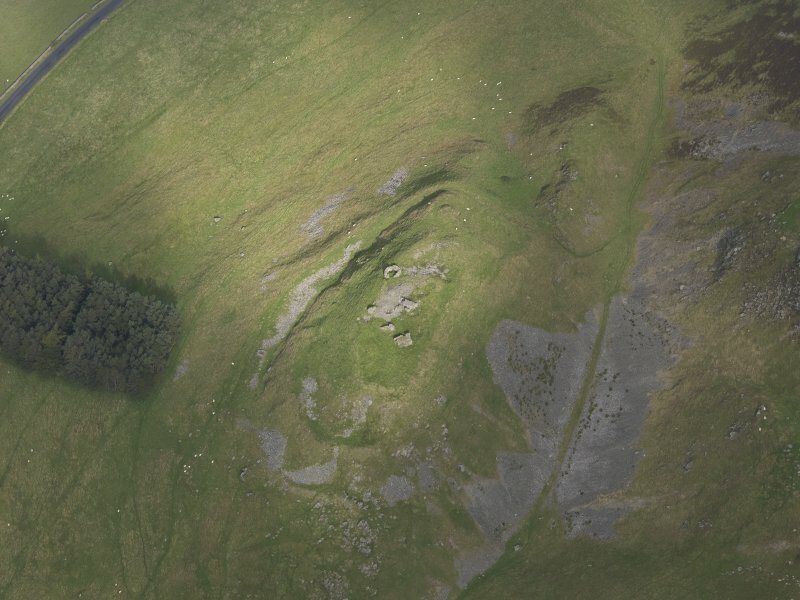 All the walls are now reduced to bands of rubble, and the only certain facing-stones that remain visible are situated at the junction of walls B and C at the NE end of the fort; a straight stretch of outer face in the centre of the ESE side of wall A has probably been reconstructed in the castle period. 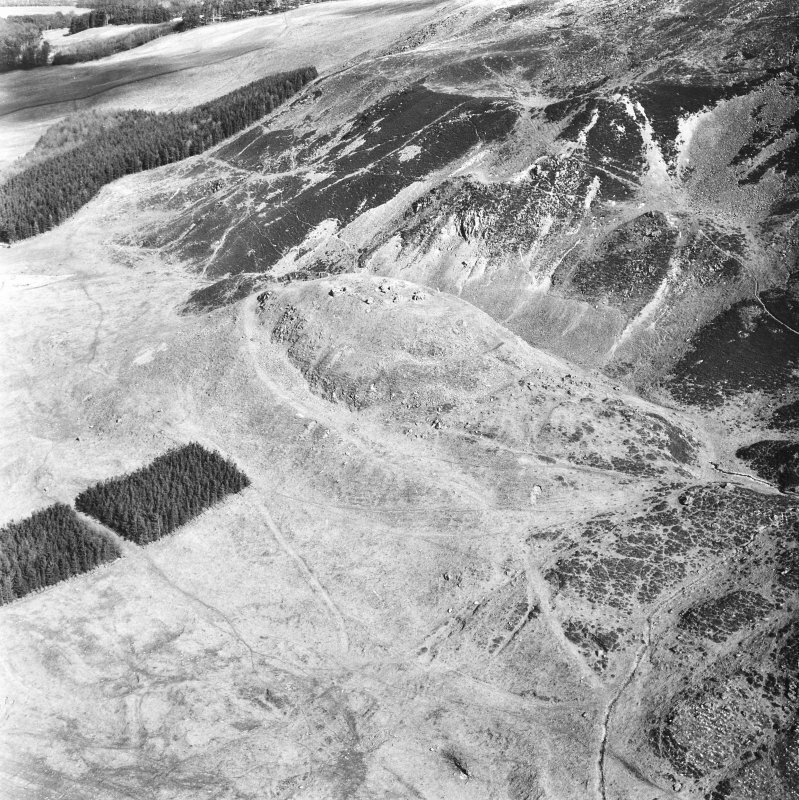 Vitrified stones visible in situ at the point marked X on plan, and occurring loose in the fallen debris on the W flank of the ridge, indicate that wall A was of timber-laced construction. 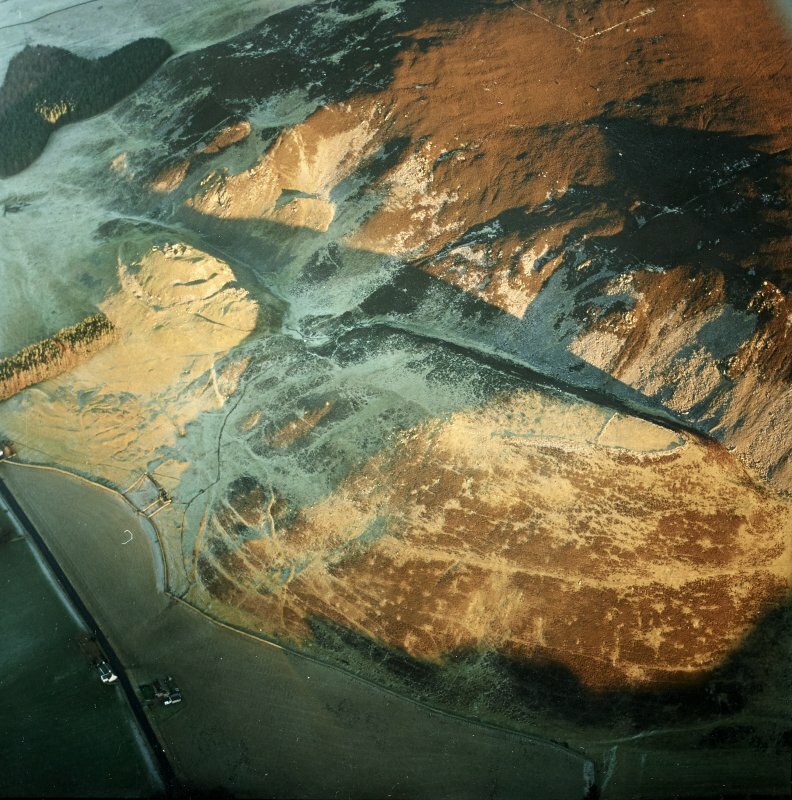 The original entrance to the fort was probably on the SW, where gaps occur in all three walls, and the ditch inside wall C is interrupted by a causeway. 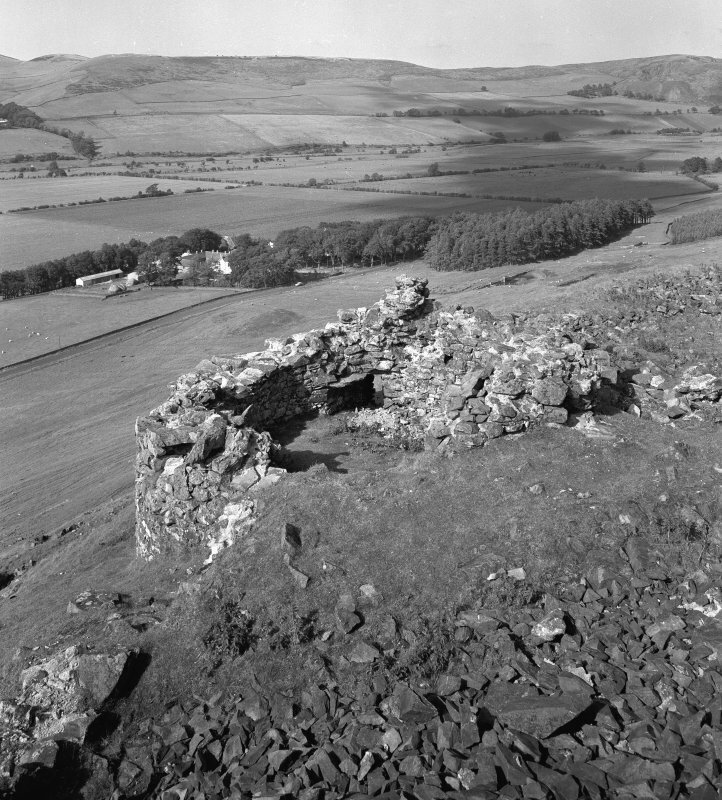 During the castle period a new entrance was made at the opposite end, and the original entrance was effectively blocked by filling the gap in A with rubble and the gap in C with a stretch of wall. 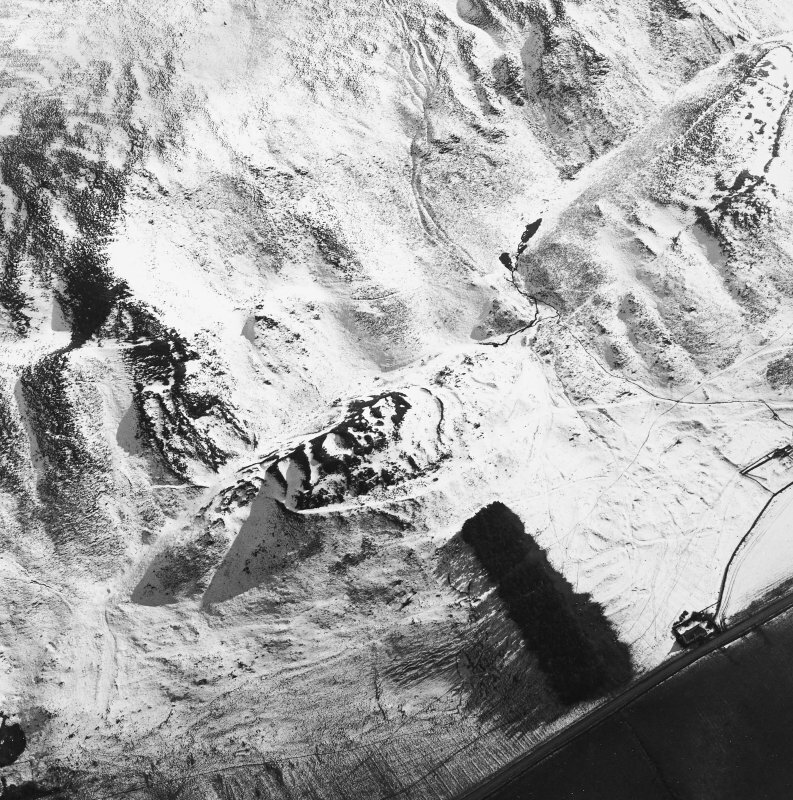 The new arrangement provided access for wheeled vehicles up the gentle gradient inside wall C on the NW flank of the ridge, and thence into the interior by way of breaches in the NE sides of walls A and B. 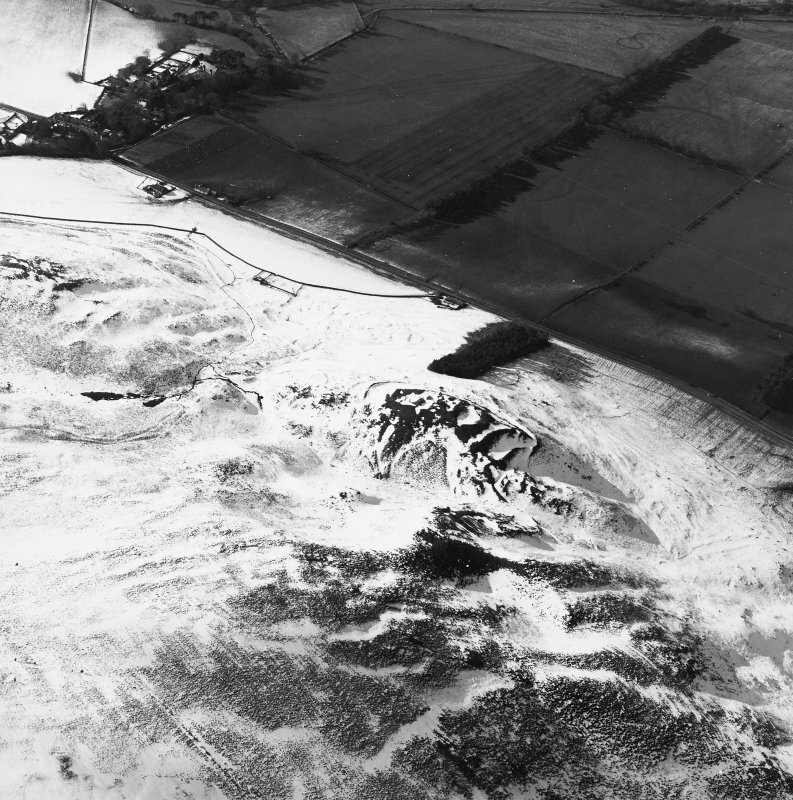 Various outworks which occur at either end of the site probably belong to the fort period. 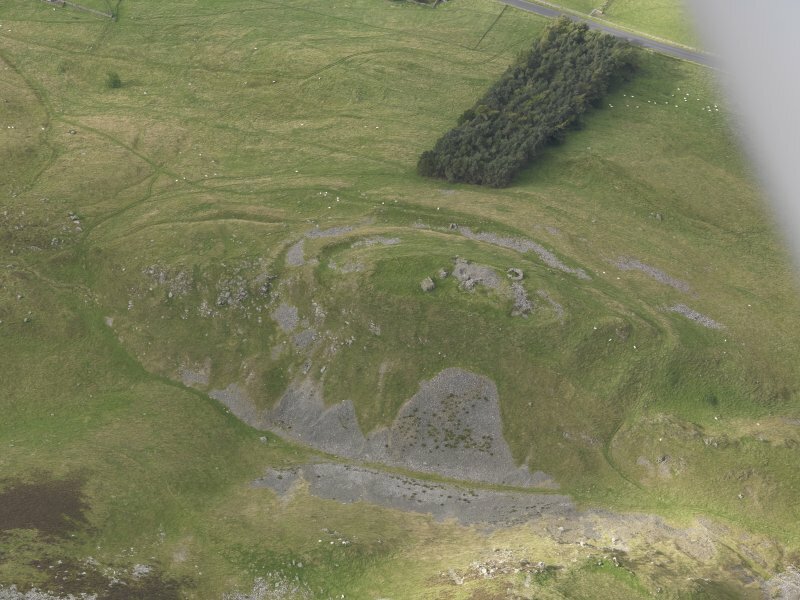 Thus, the SW end of the ridge, outside the fort entrance, was defended by a horn-work formed partly by rampart (D) derived from an internal ditch, and partly by another rampart (E) which is now represented only by a crest-line. 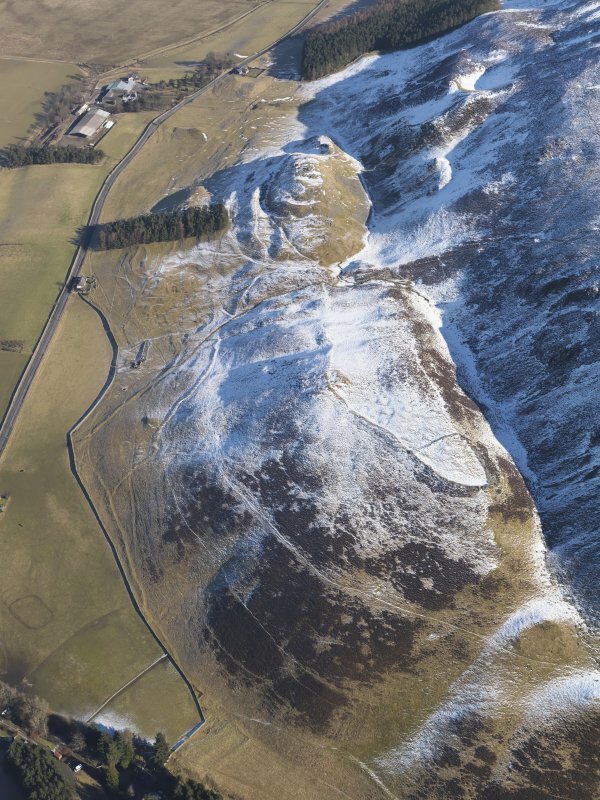 A sinuous bank (F) crosses the end of the ridge inside the horn-work on the outer lip of a partly natural depression. 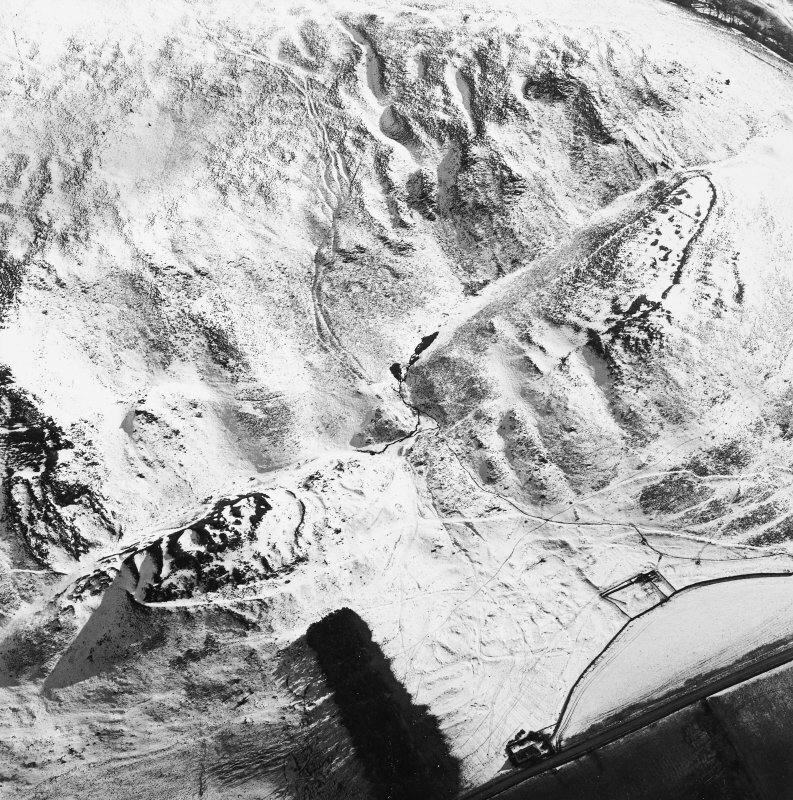 Immediately outside the NE end of the fort, the crest of the ridge, which is here only 40' wide, is cut by a ditch (G). 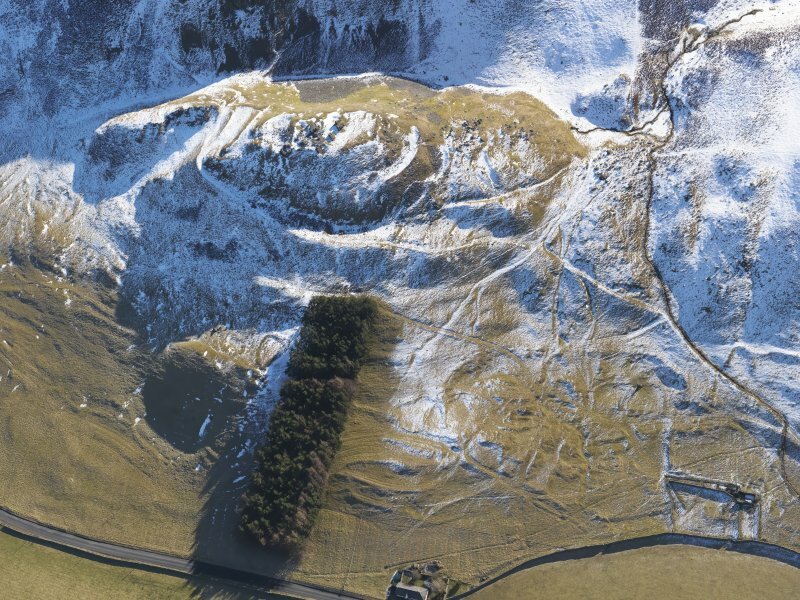 The rectilinear enclosures situated beside the roadway on the NW flank of the ridge are presumably of medieval date, and there are no signs of any dwellings of the fort period. 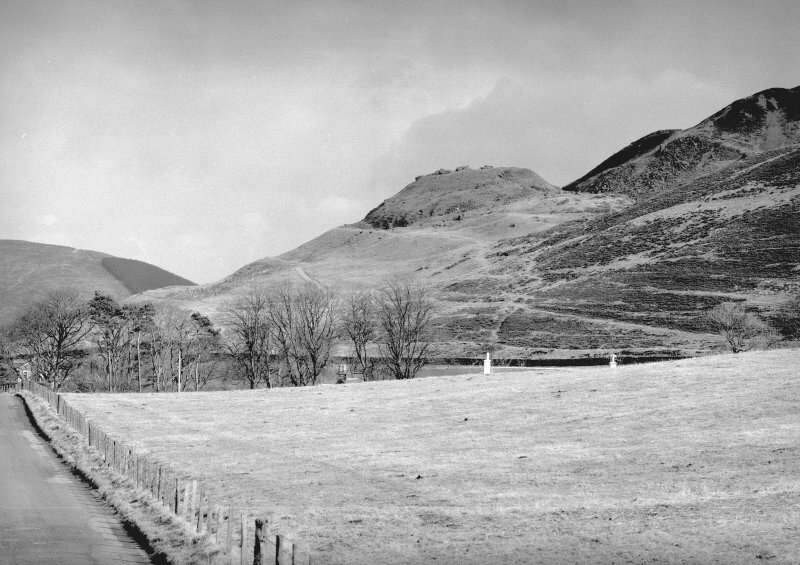 D MacGibbon and T Ross 1897; RCAHMS 1967, visited 1959 and 1962. 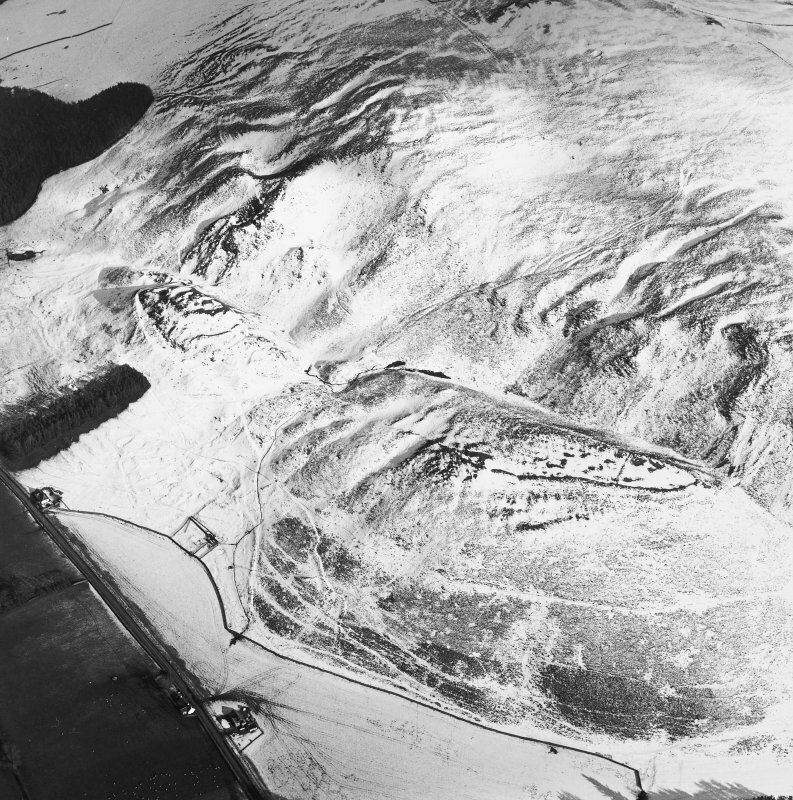 Visited by OS (IA) 15 August 1972. 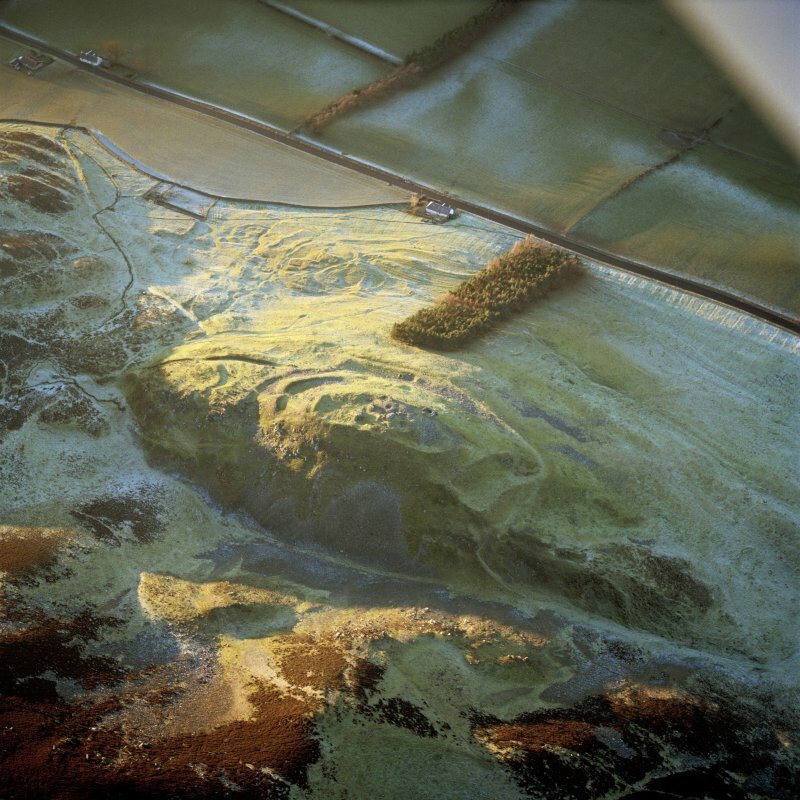 Information from RCAHMS (RJCM), April 1995. 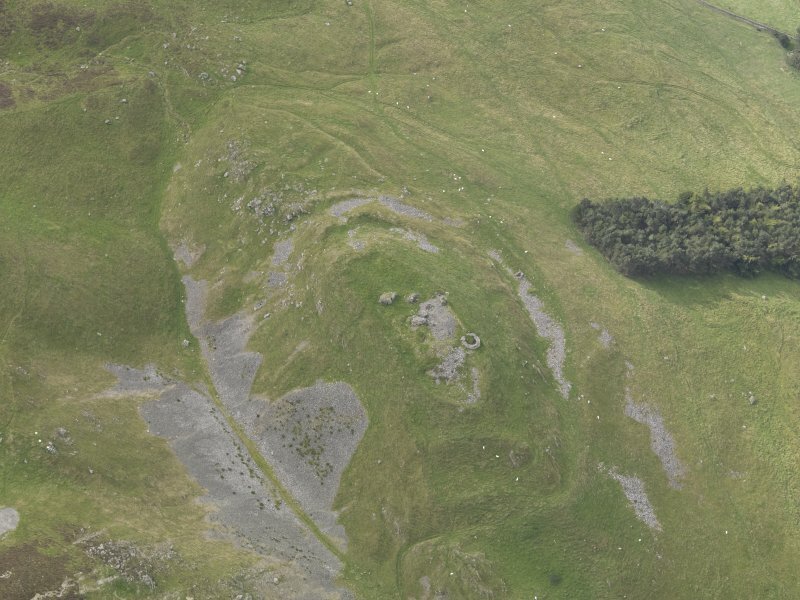 This fort is situated beneath the ruin of Tinnis Castle, which crowns a ridge carved out by a glacial meltwater channel at the foot of the W flank of Vane Law. 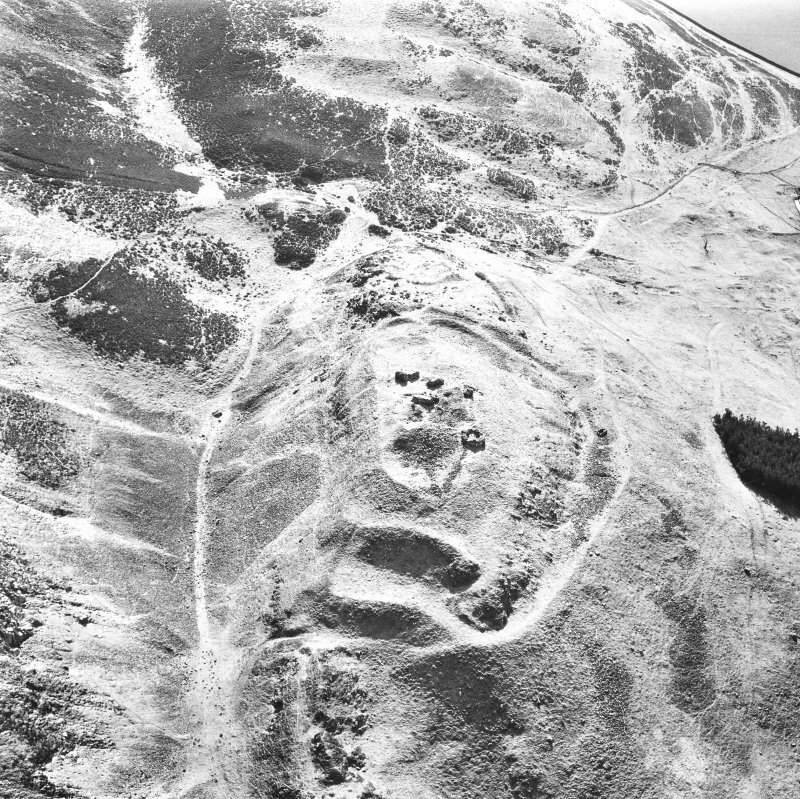 The castle itself, which dates from the 15th or early 16th century (See RCAHMS 1967, 272-3, no.531), comprises a quadrangular courtyard with towers at the NE and SW corners, and the working assumption has been that all the defensive ramparts lying outside the castle walls belong to a fort rather than an earlier castle on the same site. 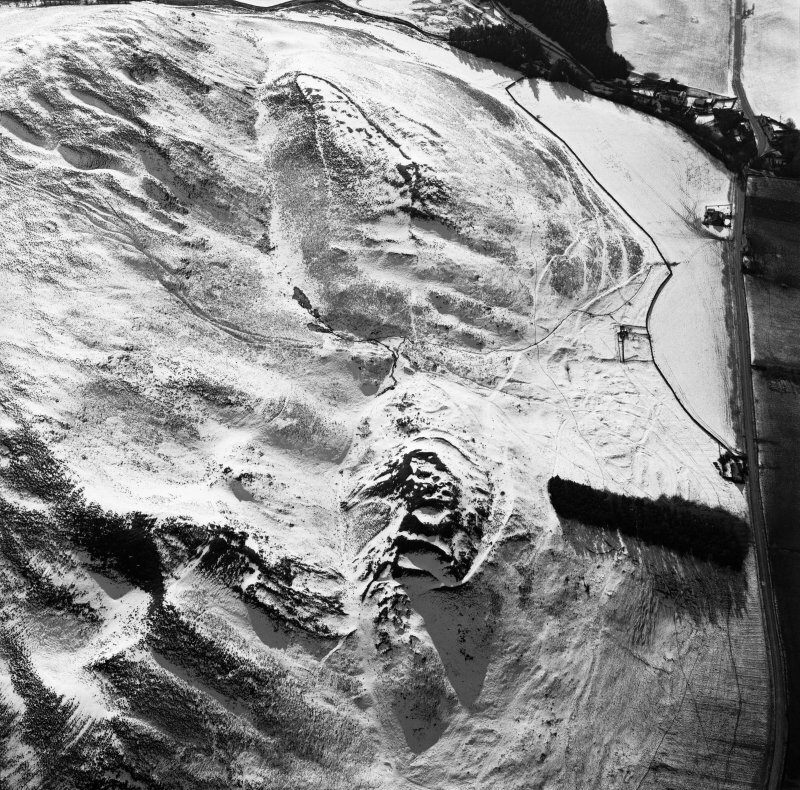 Be that as it may, the summit area of the ridge, measuring some 60m from NE to SW by 26m transversely (0.15ha), has been enclosed by a single rampart, and the discovery of in situ vitrified stone by RCAHMS investigators in 1959 at the SW end, and loose amongst fallen rubble on the W flank. 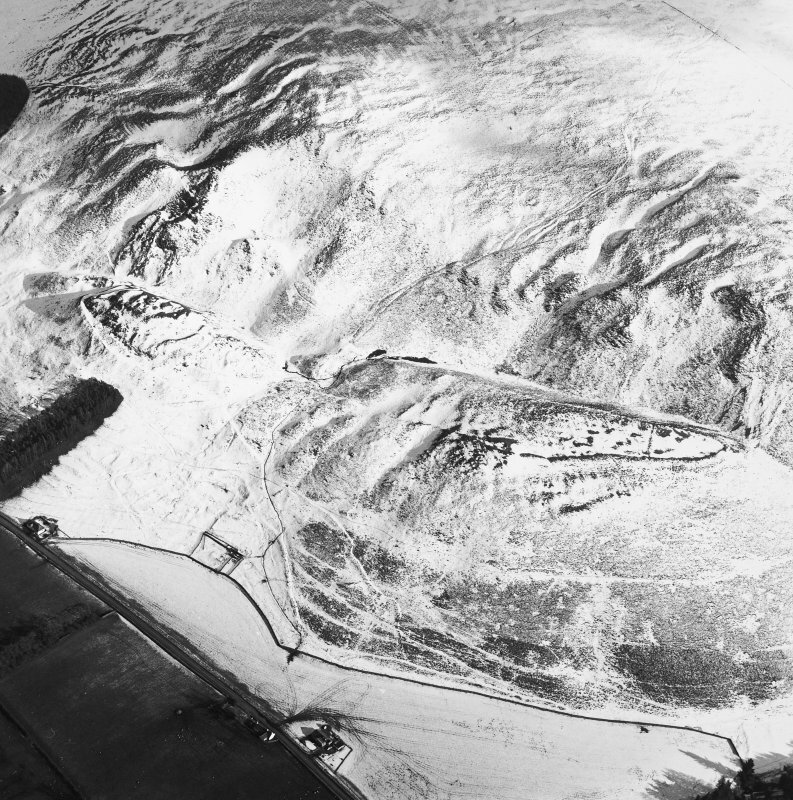 indicates that it was probably timber-laced. 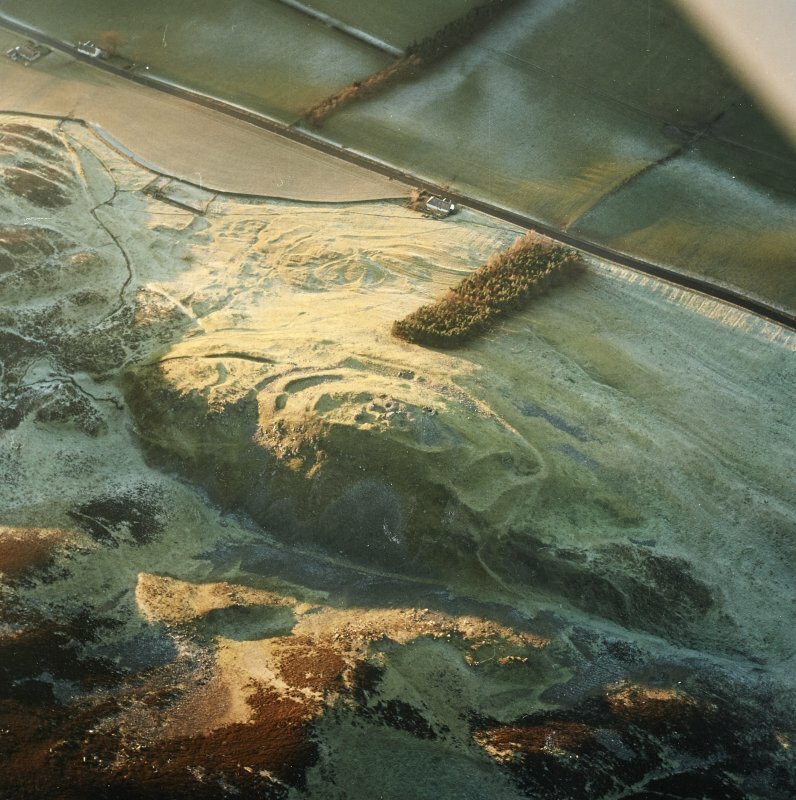 At both ends two further walls have been drawn across the crest of the ridge, the outer on the SW with an internal ditch, while the lower end of the ridge at the SW end is apparently enclosed on the W by a ditch with an external bank, and on the E by a rampart reduced to a scarp. 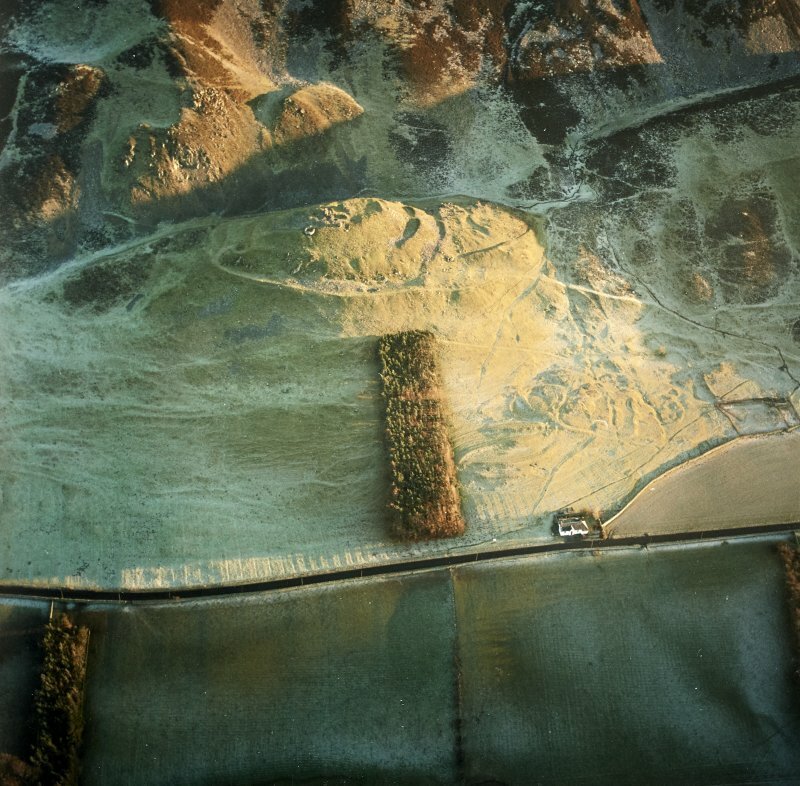 Quite how these various elements functioned as a defensive scheme, and the extent to which they may have been built or modified in the medieval period is uncertain. 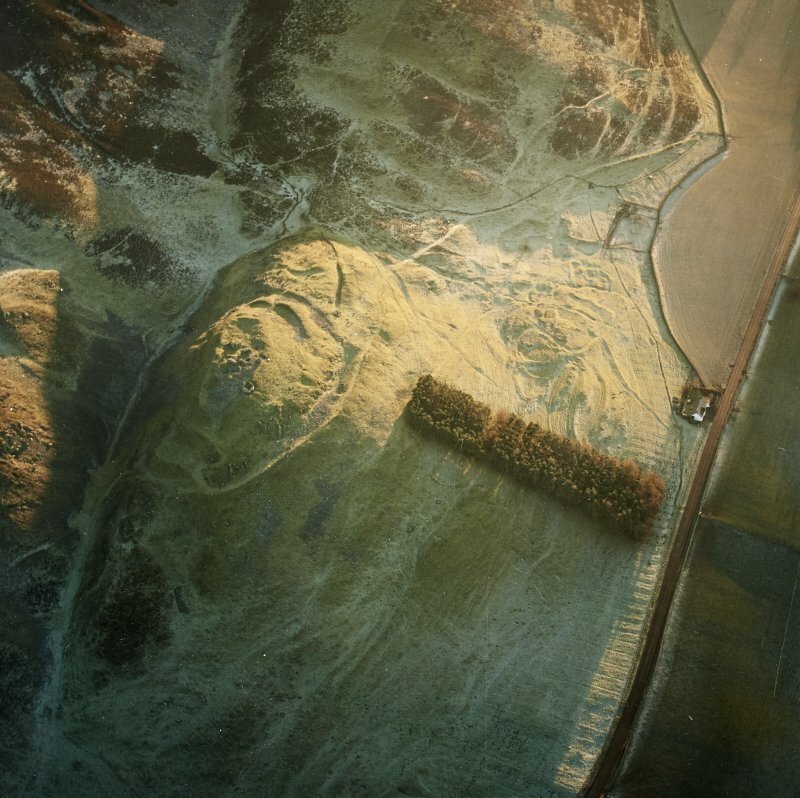 There is an entrance in the SW end, but the outer of the two walls here has apparently been reconstructed to block access through it, while the entrance visible at the NE end seems to have been the principal approach to the castle, zigzagging up through the ramparts from a well-formed trackway and may be entirely medieval in date.